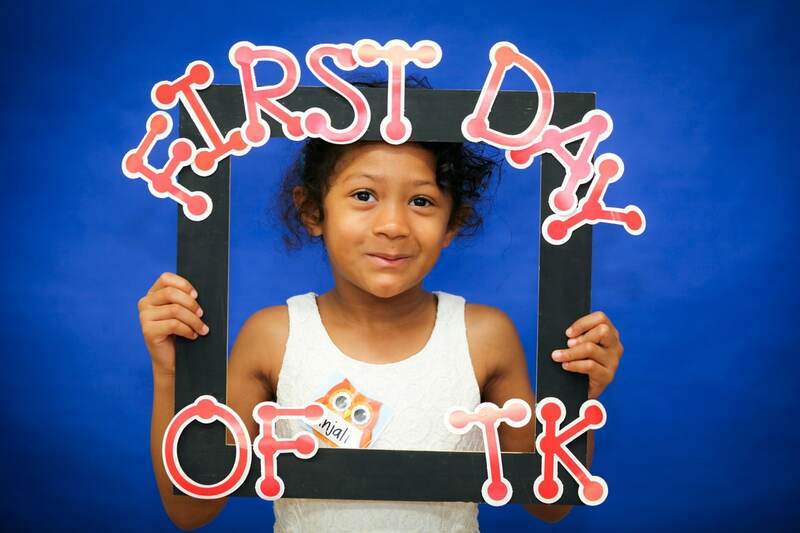 I will be emailing out a preliminary volunteer calendar to all families. If you wish to be added, modified or deleted from the October calendar let me know. I will be sending home a hard copy in a couple days after I make any requested changes. If you are volunteering, please plan to come in the room at 8:35 to see notes, directions or ask any questions. 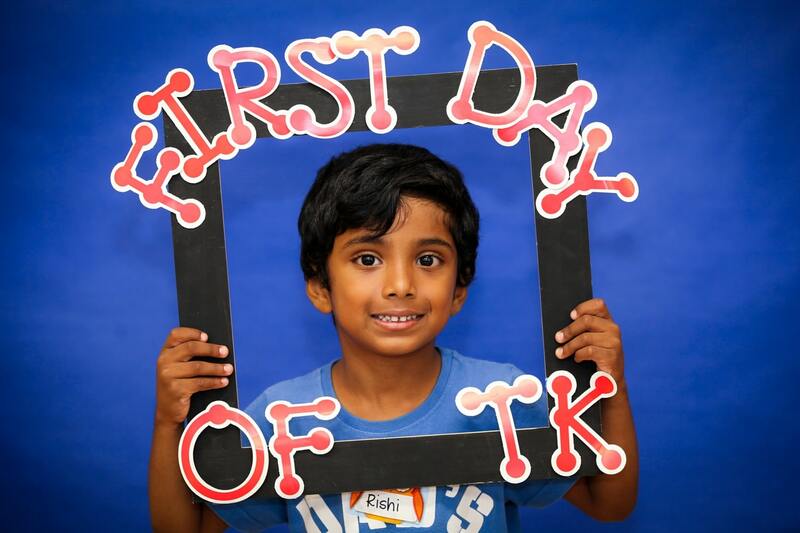 We are looking forward to having all you volunteers in our class! CLEARANCE: Mrs. Dee has been working some late nights to get the applications processed. If you get a minute, stop by and say thank you! Just a reminder, you must be cleared before volunteering. I know many of you are not cleared so far. Not to worry! Just send a quick email that you haven’t been cleared and keep looking for updates on the clearance list. Nurse Dee will be sending out one soon as she was up super late try to get them processed this past week! We are in our new unit of Numbers 0 – 5. Though many students are able to count to 5 we worked beyond the counting to name the number we counted, hold on to the number and to understand the quantity. This is all to work on building a foundational number sense that is imperative to build a more complex mathematical understanding. 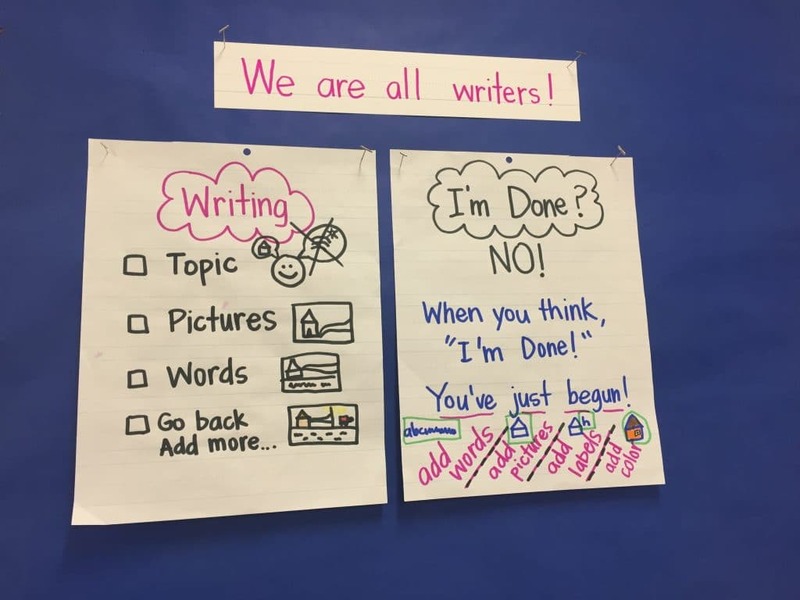 In writing, we are continuing to build stamina, a love for writing, a realization that we are writers, and growth mindset about mistakes….we learn from them therefore we love mistakes! 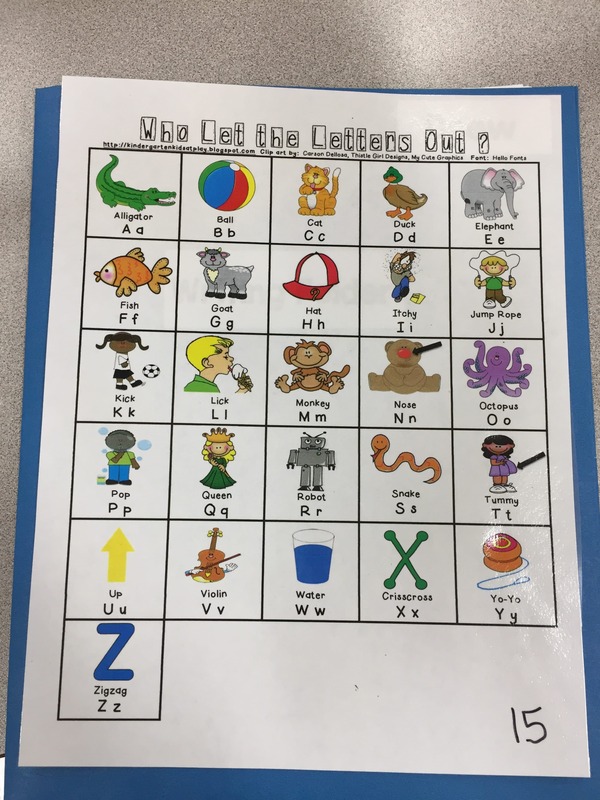 One valuable tool the students got this week, was an alphabet chart. This was not any old alphabet chart, but the one we use every morning to sing our alphabet sound song. 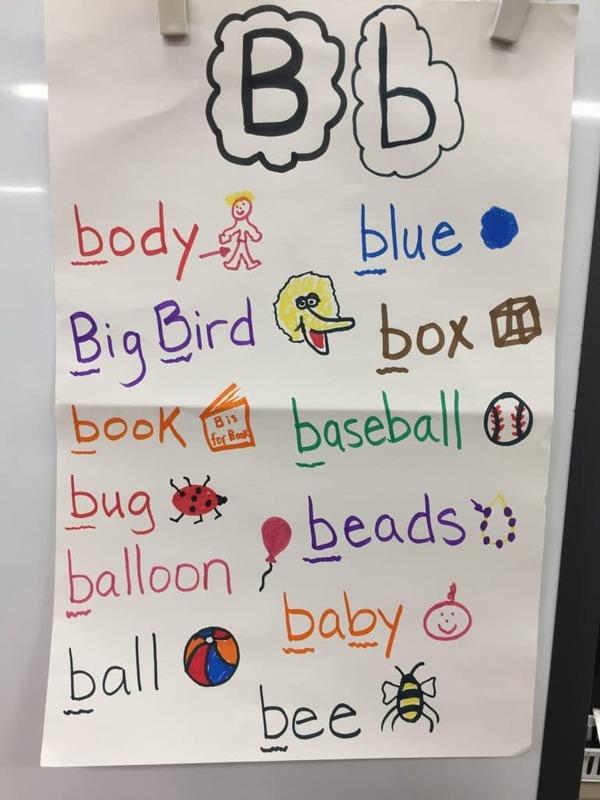 Many of the students were using this chart to write down the sounds they hear in the words they are trying to write. Having their own chart was very exciting and super helpful! In addition we worked on “action marks.” The students drew action marks in their pictures to show movement. For example, the action marks could show someone kicking, wheels turning, etc. 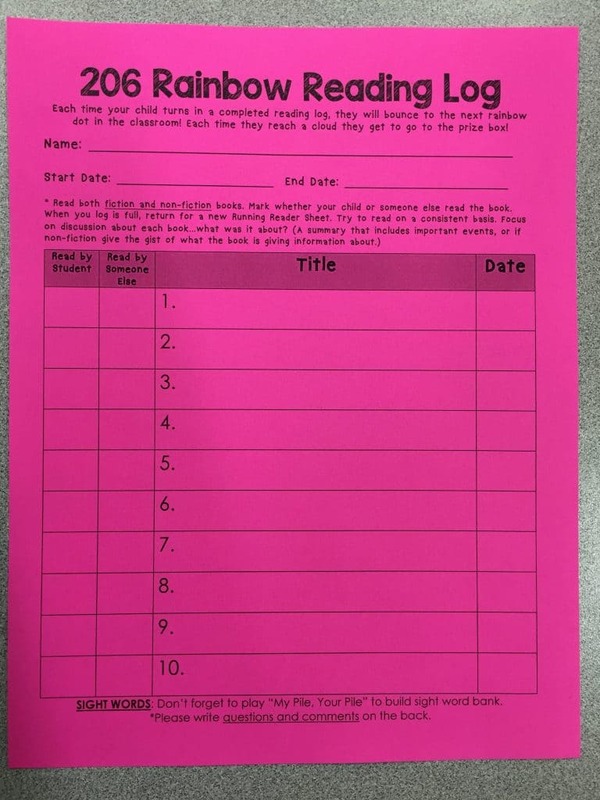 Your child also received their first reading log this week. 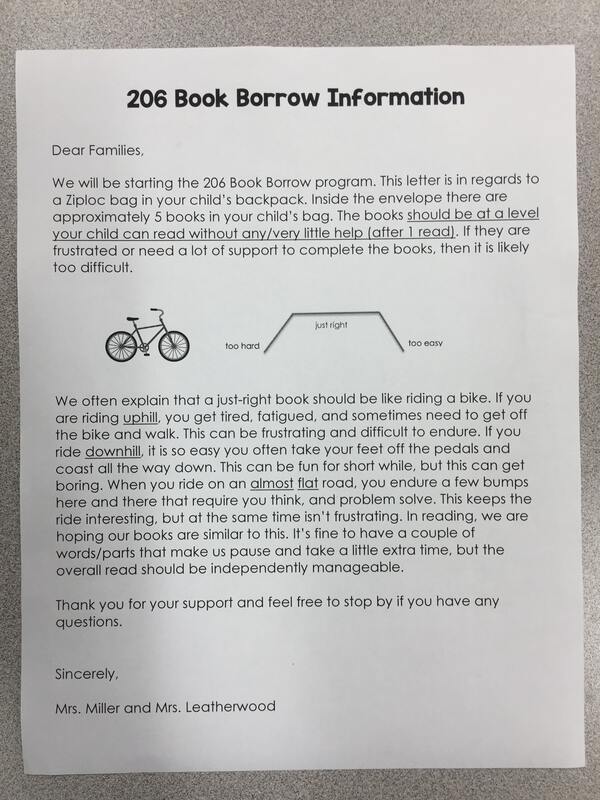 As you read to your child, or as your child reads to you (or with you), mark down each book read. This may be a lot at first as the books go quickly and books are reread. Not to worry! 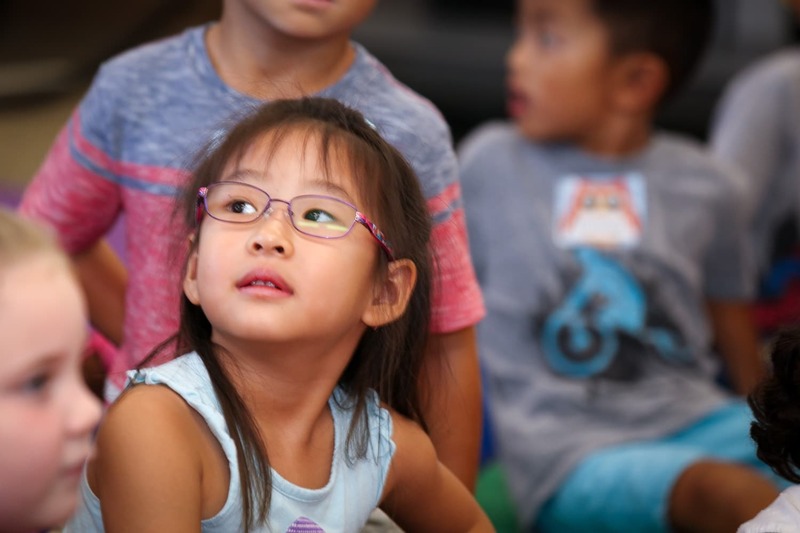 The goal is to build reading time, reading motivation, and rereading in familiar books! 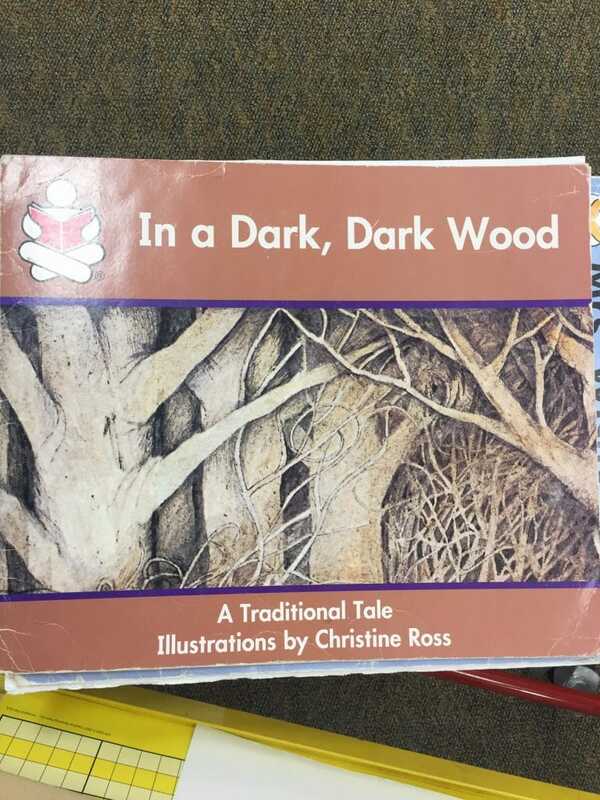 Don’t forget to log down all the books you read to your child as well. When you fill up a chart, send it back in your child’s folder and a new one will get returned in exchange. 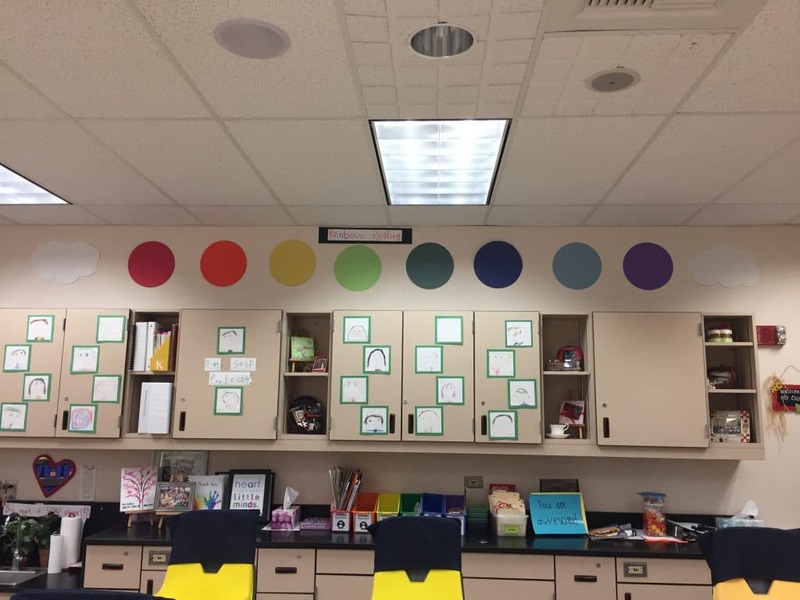 For every chart filled in, your child will move across the rainbow! When they get to the cloud, they will get to choose a prize from the prize box and will head back down the rainbow to the opposing cloud for their next prize! This is exciting for the kids and a great goal to read, read, read! Please check out the helpful points and make a note of any observations, questions or behaviors on the reading logs. We will respond to any questions or observations that you send in! This week Mrs. Leatherwood did a watercolor art project with the students. This was a 2-day project in that they drew the picture the first day with a permanent marker and then watercolored it in the second day! Check out these artists! 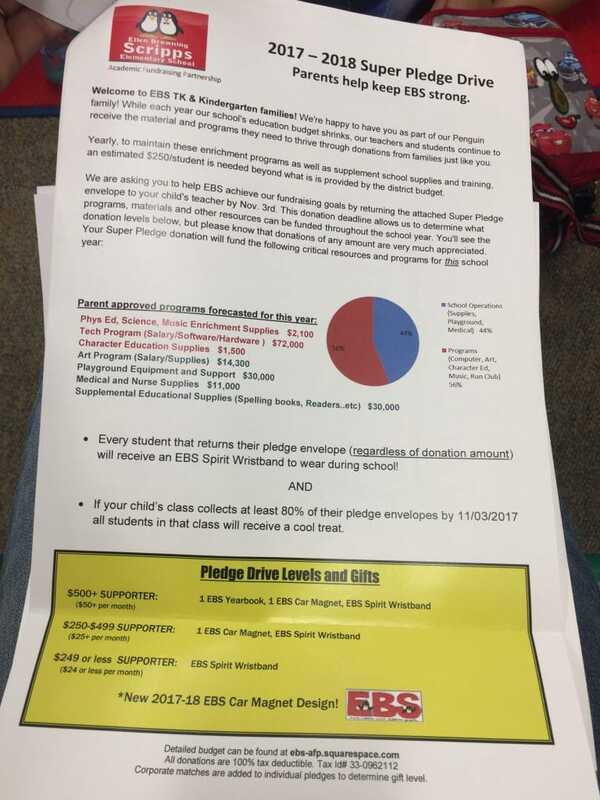 Superpledge is still going on, through November 3rd. Our class is at 57% for turning in envelopes! Thank you again for all your support to create this fantastic learning community. This week’s color was blue! 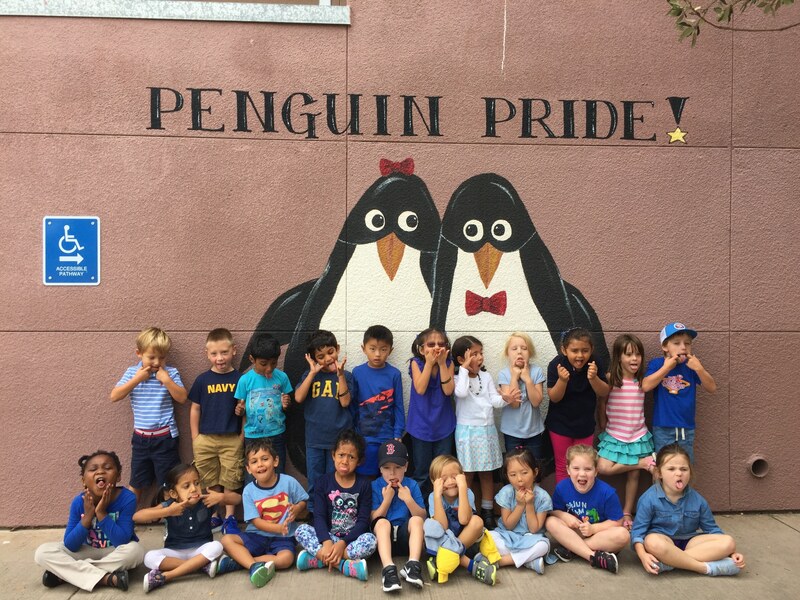 Check out our smiley and silly picture as we all celebrated on Blue Day! The new hook area for Room 206 is up and running! We started using these on Thursday morning and have transitioned quickly! 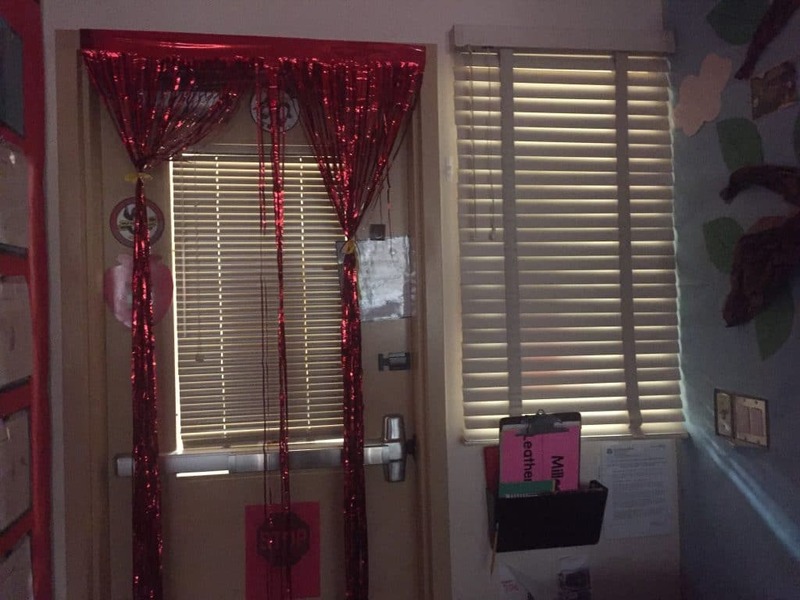 They are decorated with flowers and labeled with your child’s number. This week in math we finished our topic of sorting and classifying. 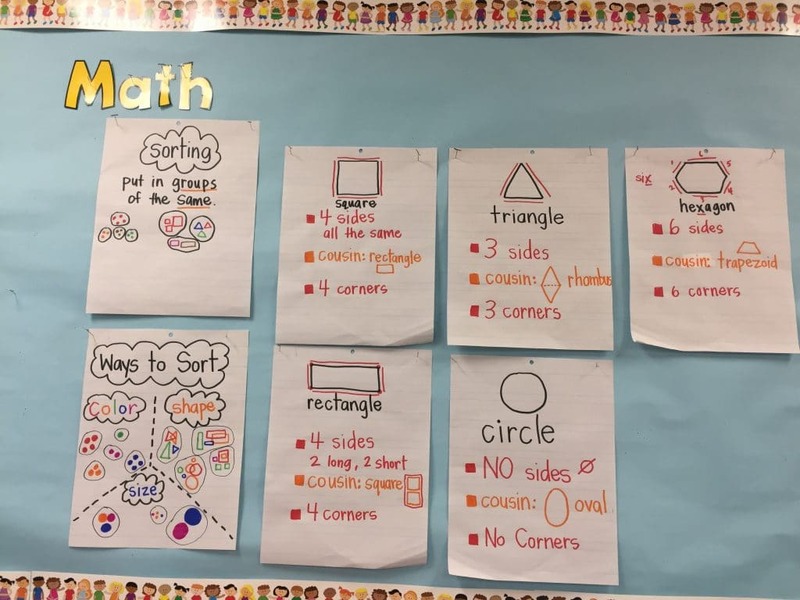 We practiced sorting 3 ways and if a child finished they were able to try to think of an additional way they could sort the tool we were using. Please continue to practice this at home as some students would mix up sorting methods. 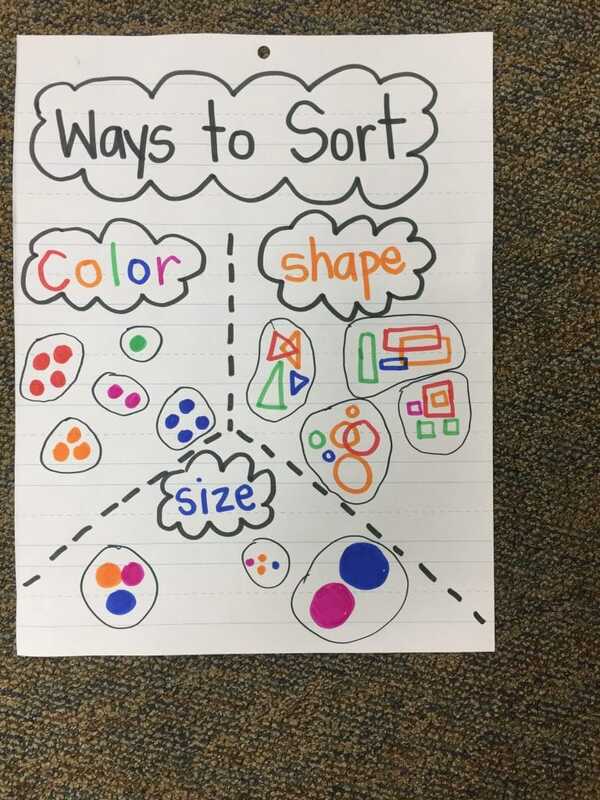 These are the 3 ways we sorted in class. Wow! I have to say these kids amaze me! This week we practiced some more lessons on expanding and improving our writing. Labels: One lesson we shared this week was about adding labels to help your reader know “who” and “what” are a part of your story. Details: We also shared a lesson about adding details. We defined details as words and pictures that give more information about our writing. 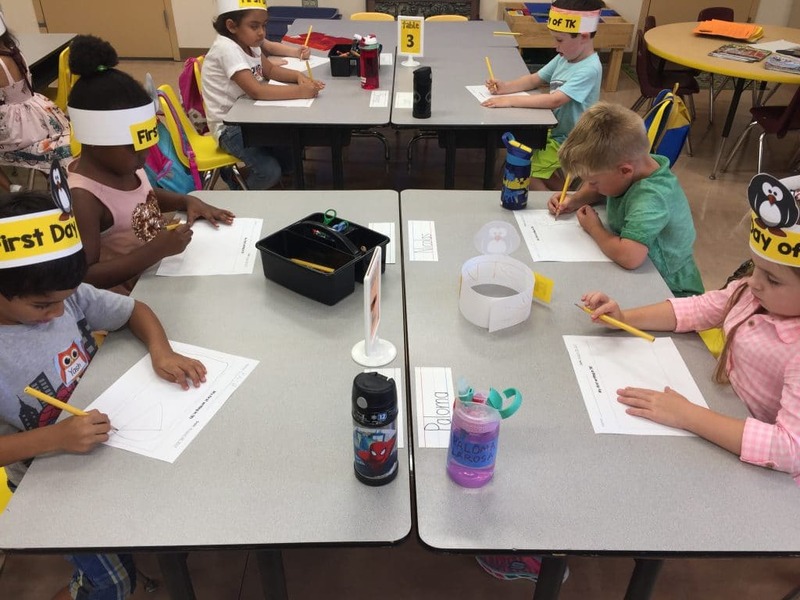 The class is growing there stamina to work independently and starting to say the words they are writing to help them determine which letters correspond with the sounds to write down for labels/words/details. They are such great try’ers! We start our interactive writing each time by writing our name with proper casing. 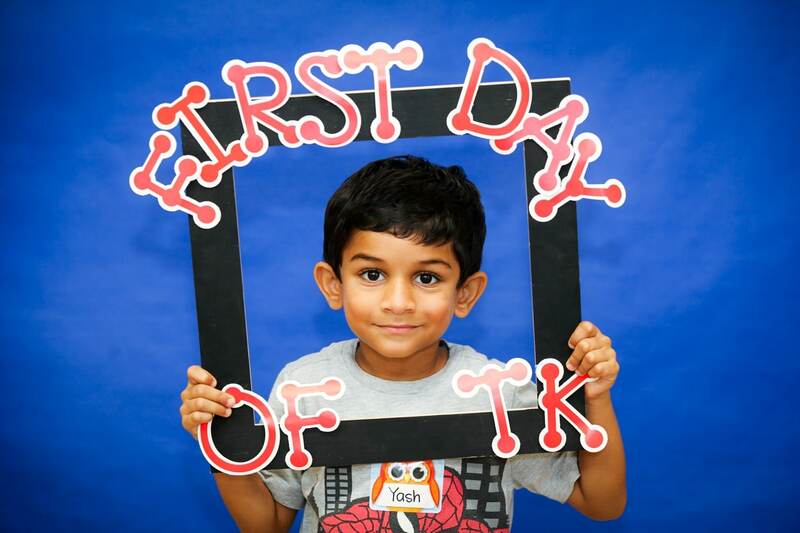 Some students are already practicing their last name as well. 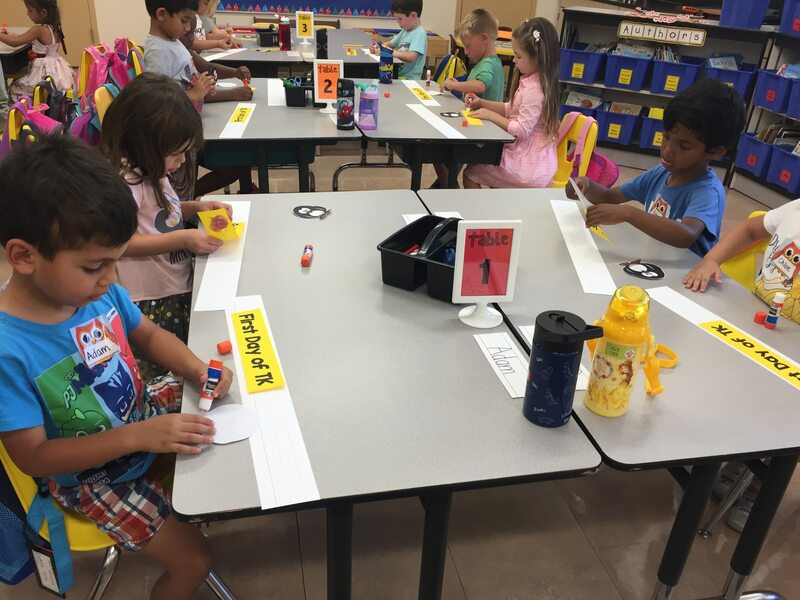 Once everyone is ready, we continue writing friends names to practice letter formation and direction. 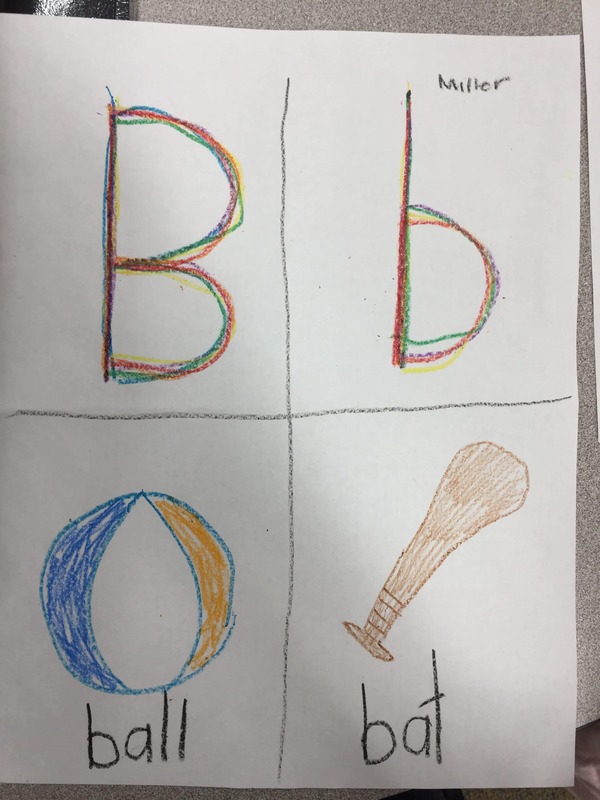 This week, we also practiced writing the color of the week. 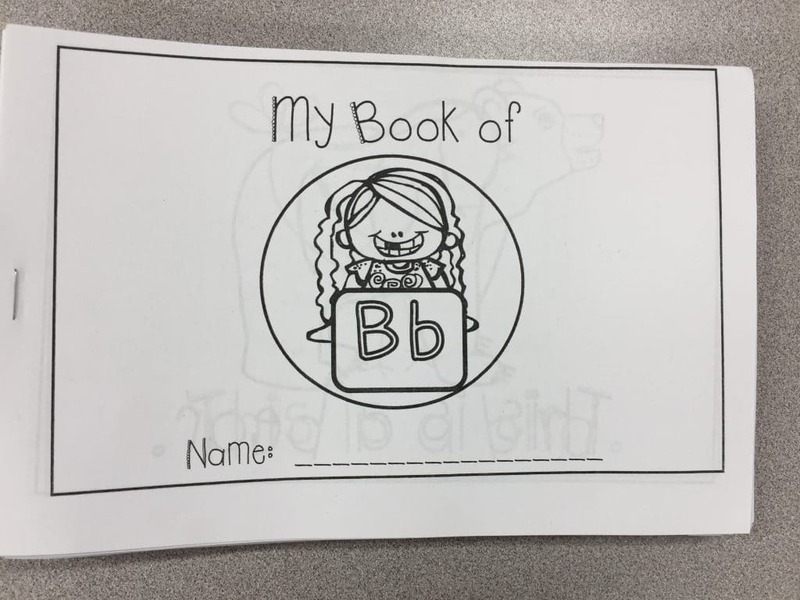 We wrote the word “red” and practiced writing the letter Bb. 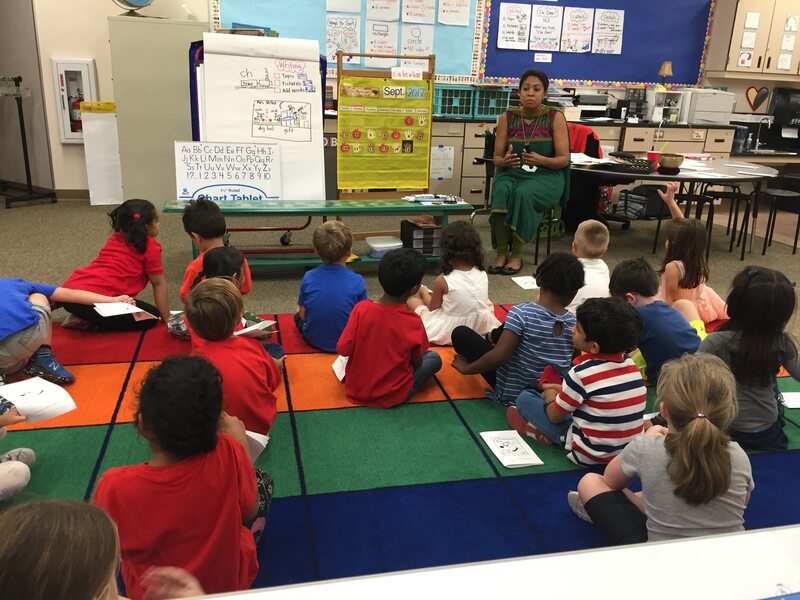 A great thanks to Fran Ayalasomayajula for coming in this week to introduce the students to our very first Character Education trait and lesson. 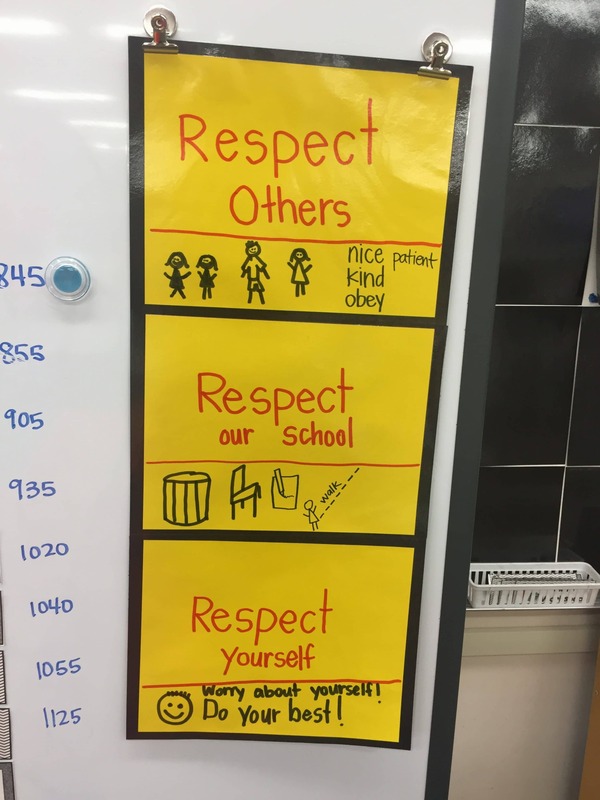 During September our school focuses on RESPONSIBILITY. 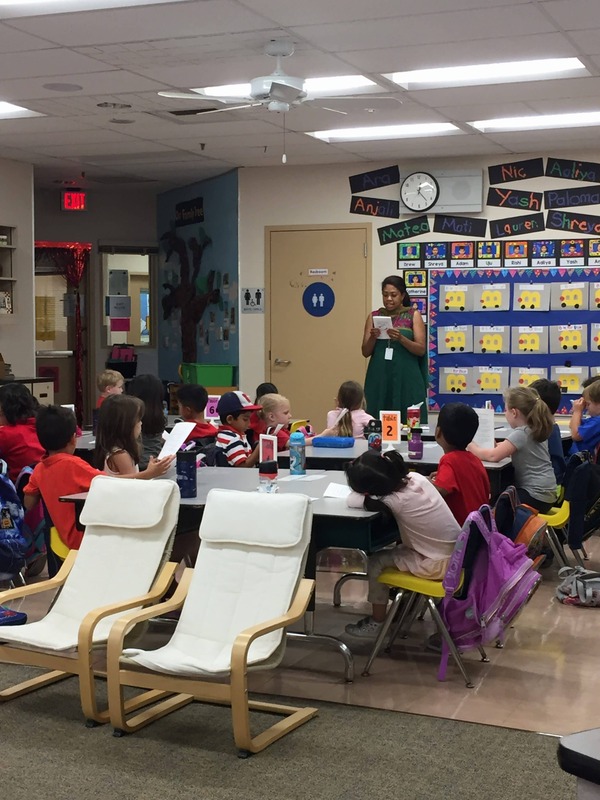 In her lesson, Mrs. Fran came in and gave a brief introduction to what RESPONSIBILITY is. 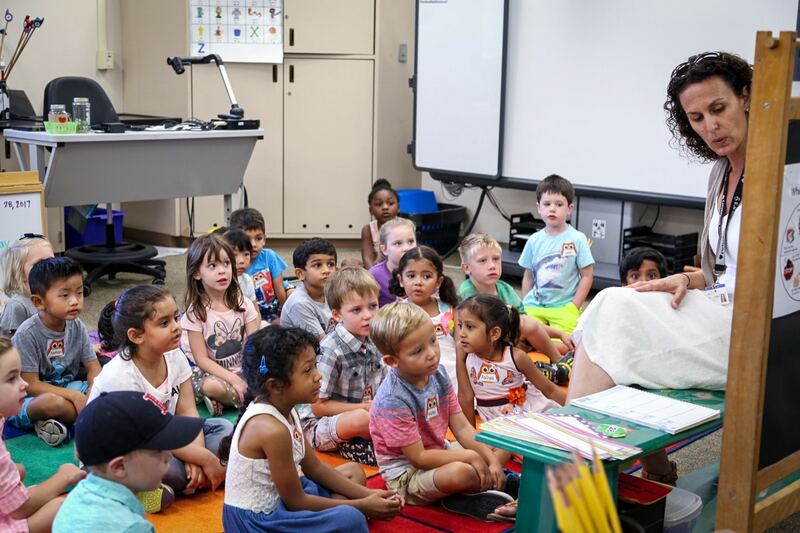 Then she read them the book, “Franklin is Messy” to help show a story about responsibility. 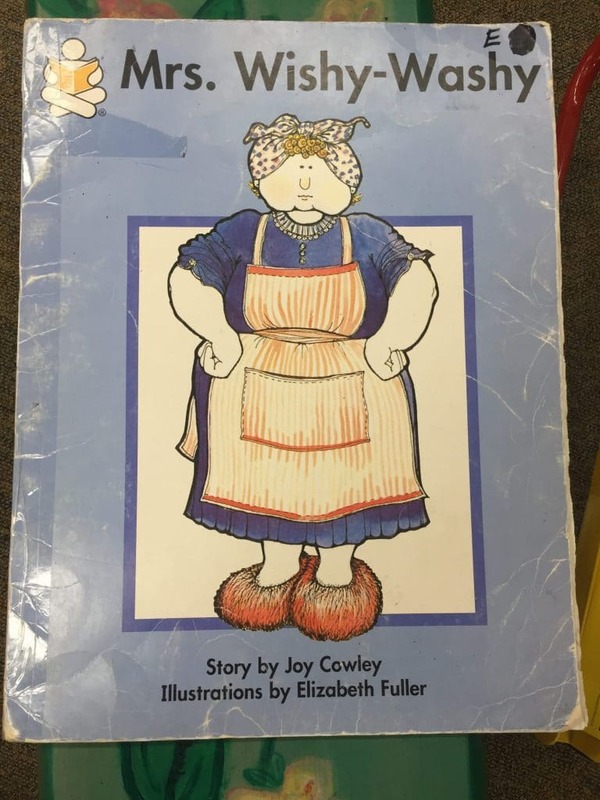 She had them share an example they noticed from the book. 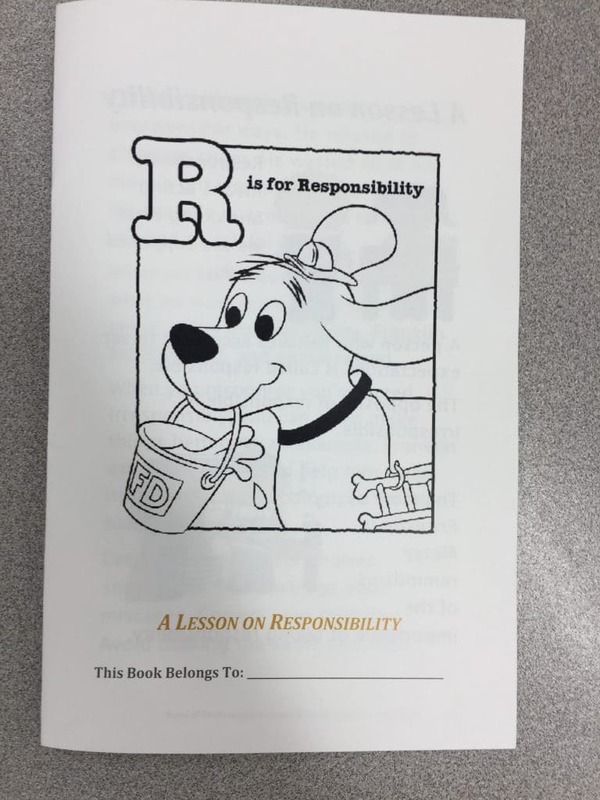 After the story, the students went through a booklet that she gave to each of them about responsibility. 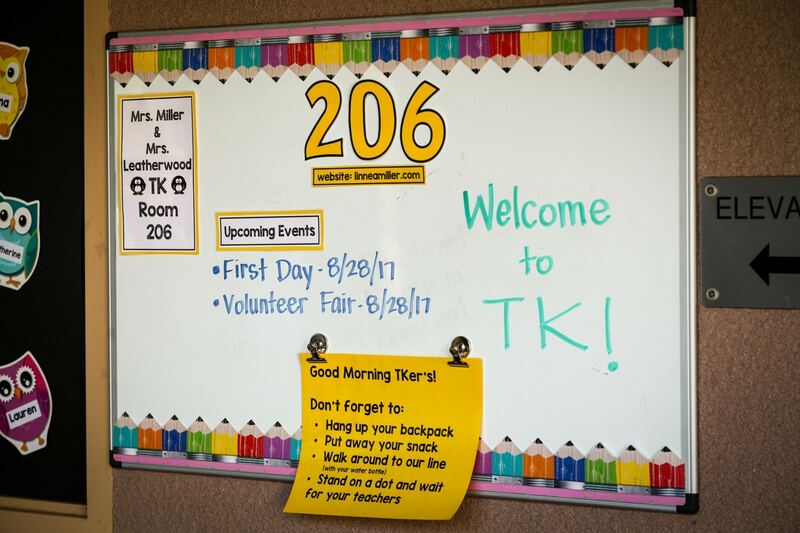 At their desks, she explained the EBS descriptions of responsibility at our school. We weren’t able to go through the whole book due to time. These went home on Friday and you may complete them and go through them orally together. 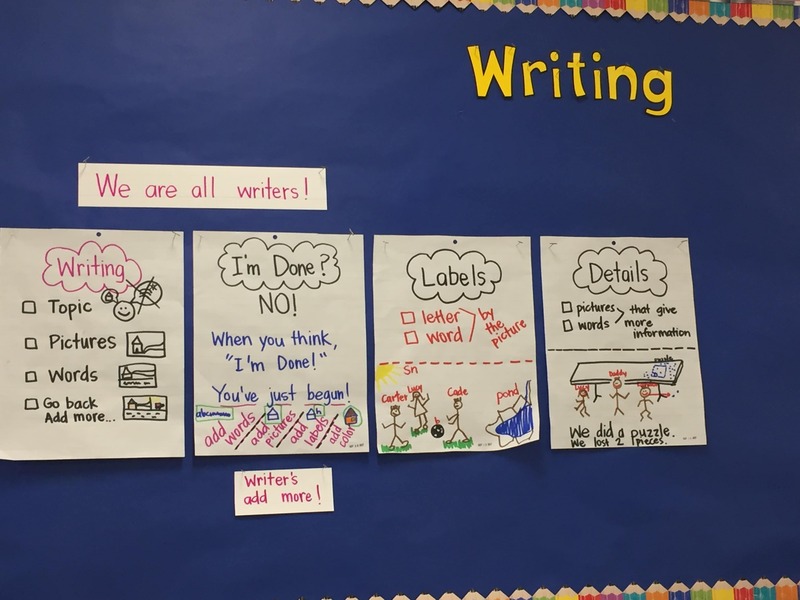 You may help them by writing down their ideas for the writing portion. Try to recall this word at different points through your month to highlight the trait of responsibility so they become more familiar in recognizing responsibility and how it is important. This week Mrs. Leatherwood, focused the art around the letter of the week! 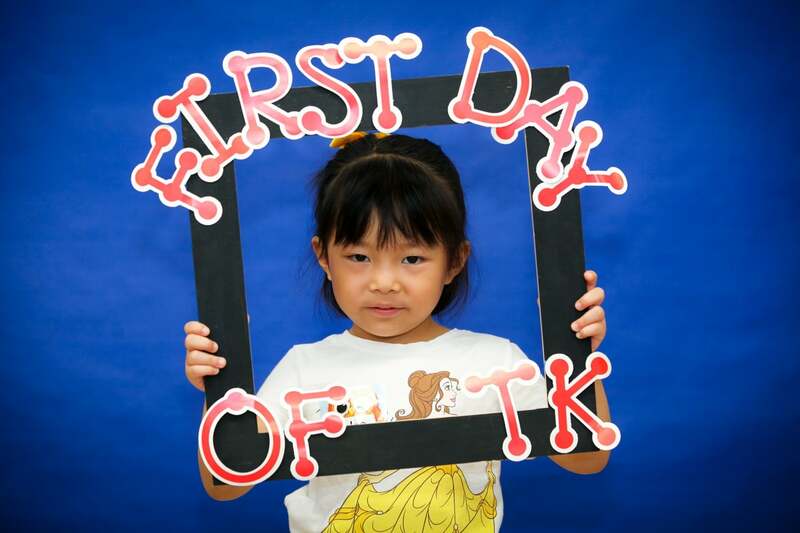 This week, we focused on our first letter/sound…./Bb/. 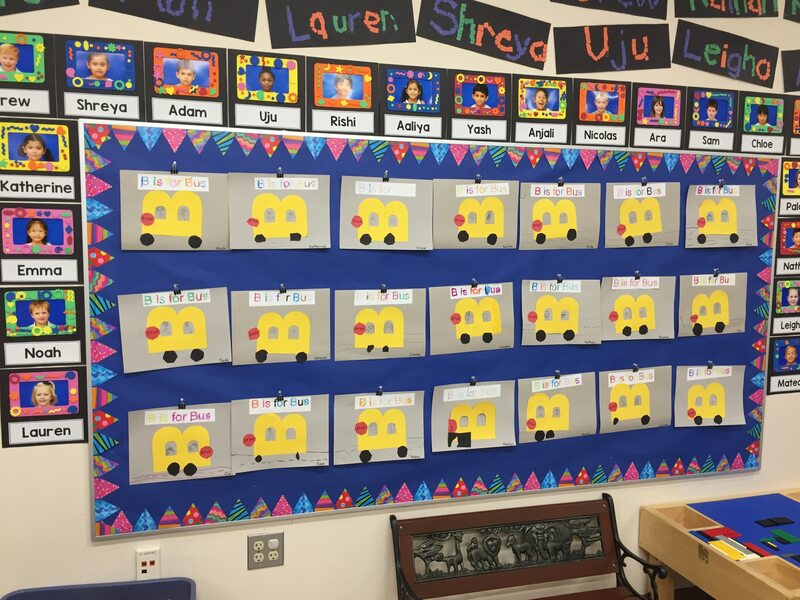 For their art time they each mad a picture of bus using a large “B” and cut out the wheels and stop sign for the bus. They also added people in the bus. 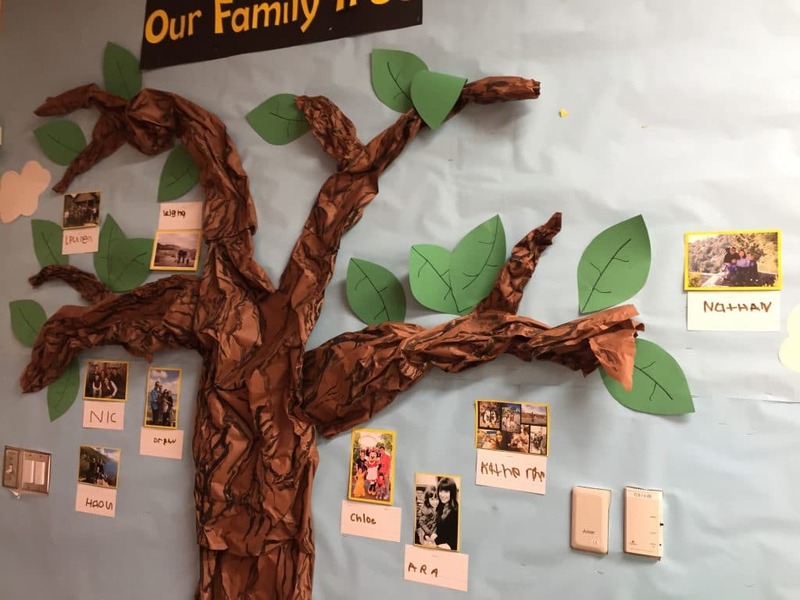 We have so many family pictures on our Family Tree. 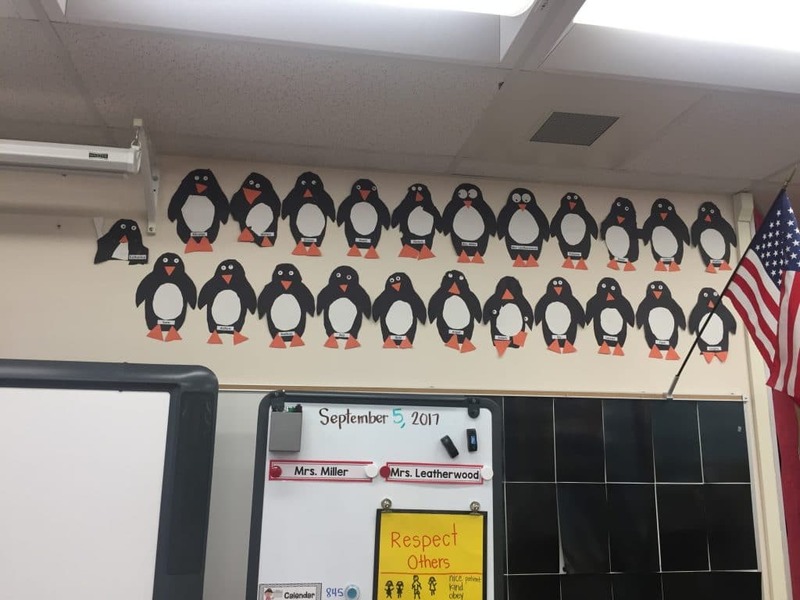 The students love these and gaze at them when we go in and out of our class. If you haven’t sent in your family picture, take a moment to print a picture and we’ll hang your family memory up on our wall! I am loving the all the reading I’m seeing coming back on all the reading logs. In actuality, I haven’t sent any home, nor are any due at this point, but I’m loving your responsibility and eagerness to read! We are preparing materials to go home this next week. 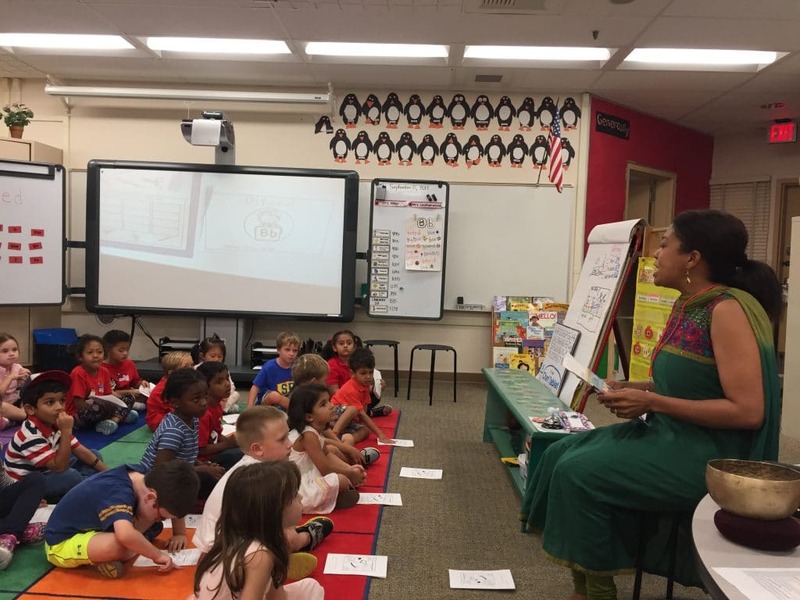 Your child will receive a Rainbow Reading Log, a Reading Ziploc bag, approximately 5 books, along with a some explanatory information. This will notify when you can begin returning reading logs in your child’s folder. Every time you return your child’s log in their folder a new one will be replaced in the folder. 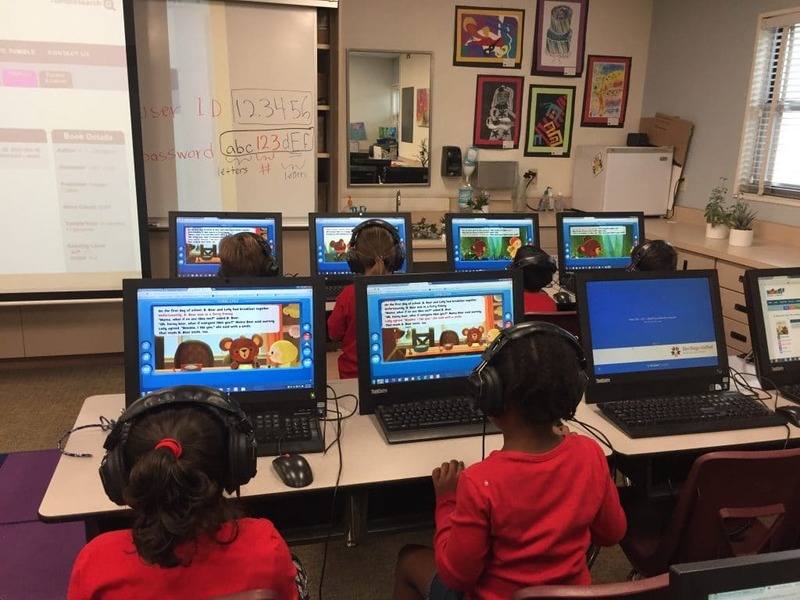 Mrs. Martin welcomed them in the lab and shared some of the basic rules to take care of the computers and how to have a fun successful class. 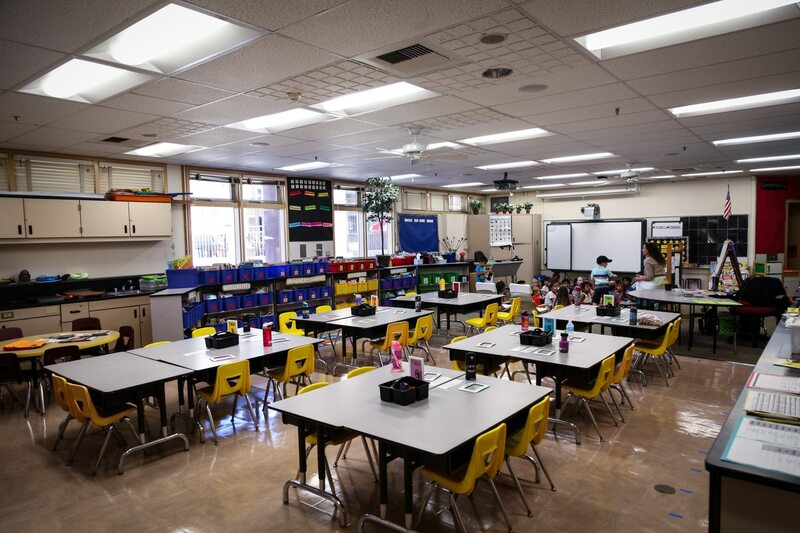 It takes a while, but the kids eventually learn how to be independent in the class. One of the biggest challenges is learning to use a mouse. This year, we will be getting new computers (the current ones are 7 years old) thanks to you all, our AFP, we will be updating our Technology Academy and learning. Did you know our school has a morning Run Club? As a lover of running, I highly promote stopping in one morning to give it a try for many reasons! Reason #6 – Running releases endorphins in our bodies which creates a positive feeling to start the day! 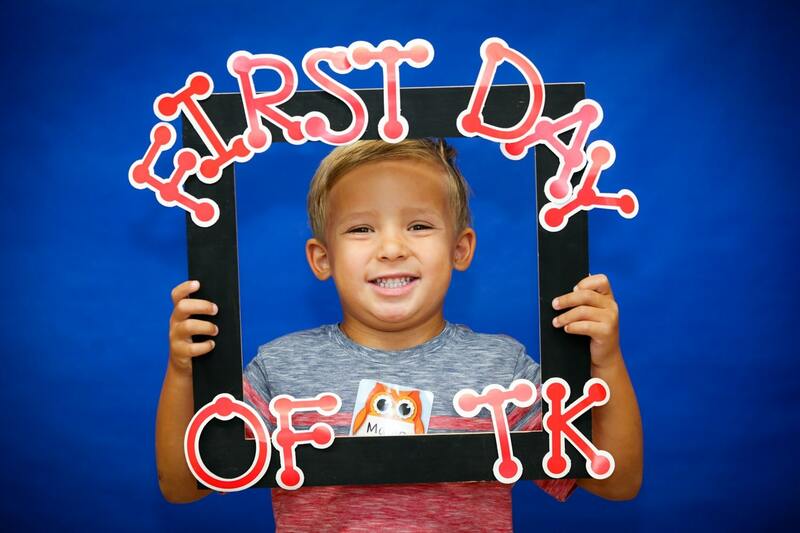 Get some free endorphins and give some to your child by running in the mornings! Reason #5 – Mrs. Miller is often at Run Club each Monday to run with her family so your child can get a high five when they pass me by! 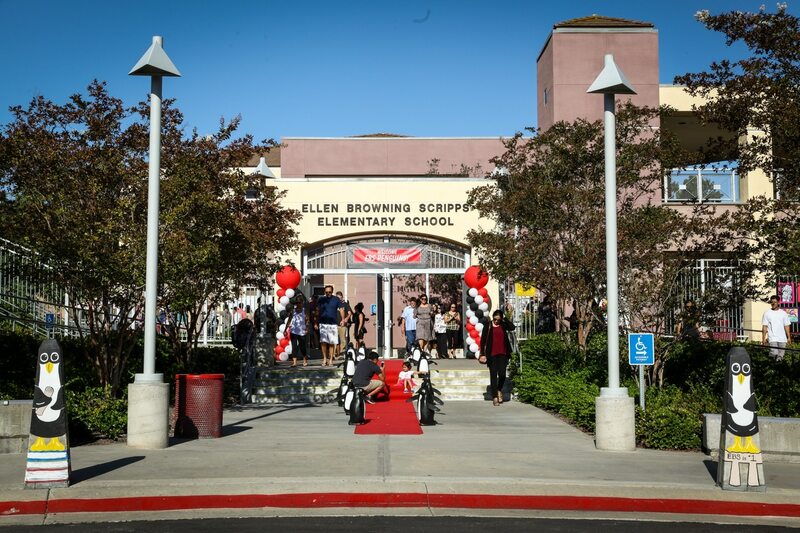 Reason #4 – You may see some 206 friends out there, or meet some new EBS friends! 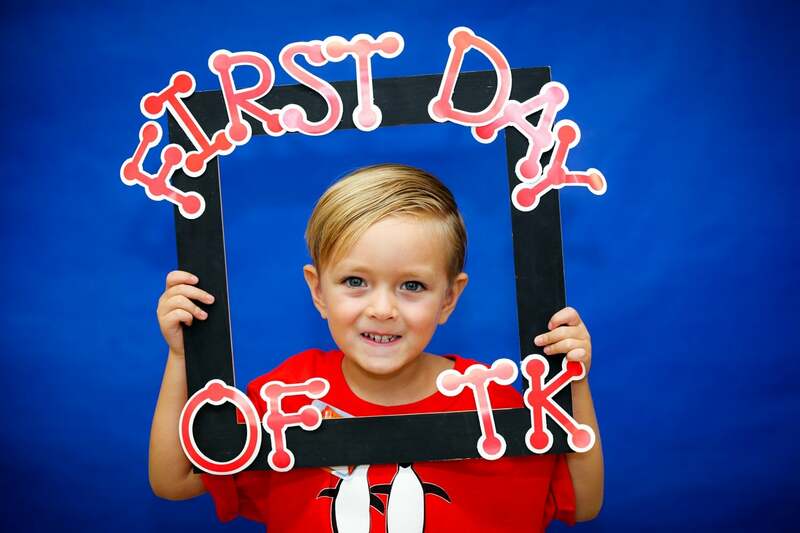 Reason #3 – Your child is working towards running goals (annual goals, lap goals with rewards….every 25 laps your child gets a prize, every 100 laps your child gets a ribbon, at the end of the year your child will receive a certificate for their total laps, daily goals….how many laps can you get in one day?). 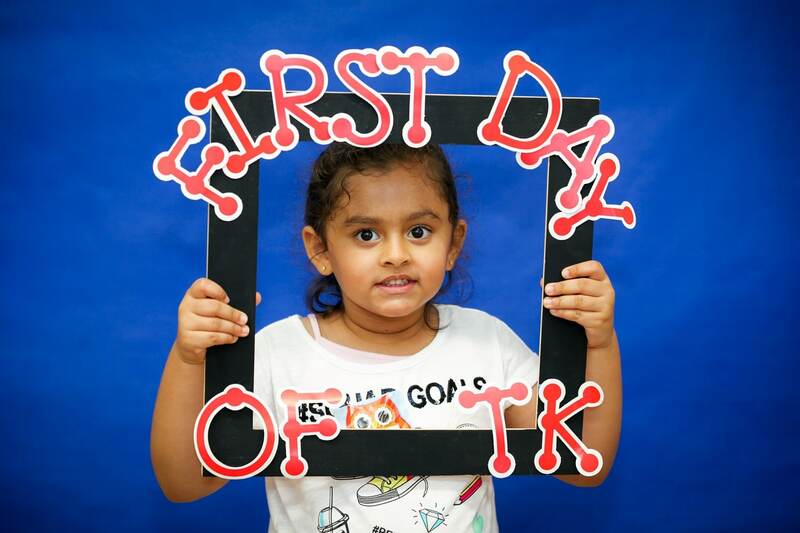 Reason #2 – Your child gets to start their day with exercise to increase their healthy habits (and you can too…it equates to around 2500 – 3000 steps for each time you participate). Reason #1 – You get great parking since you at school early! Run Club is 5 days a week from 8:15 – 8:30 at the field closest to our school. You must sign a waiver your first time with our Run Club Coordinator (Janice Hartung). When it ends at 8:30 you can walk down towards the school and the gates will be open. We hope to see you there! 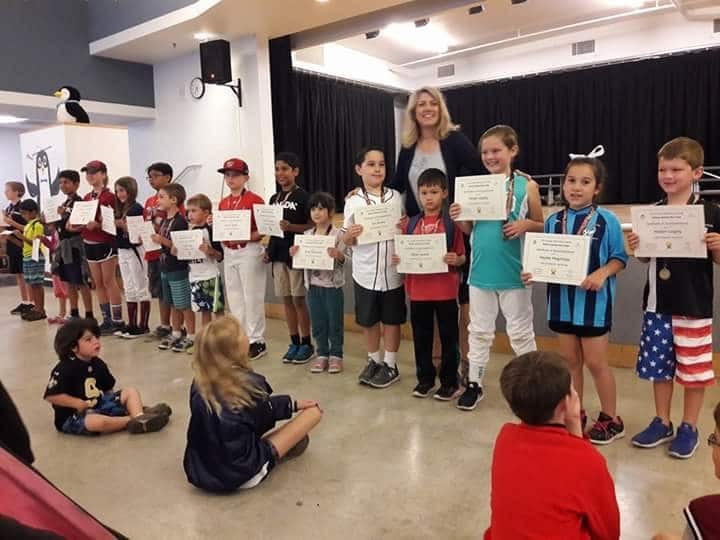 End of the year Running Club Awards Assembly! Thank you to all who have returned their envelopes. There is still plenty of time as I know the students may have been asking you to return yours. I am reminding them regularly that we have a bracelet for everyone that I am keeping for when each envelope is returned so that they don’t feel they need their bracelet now. 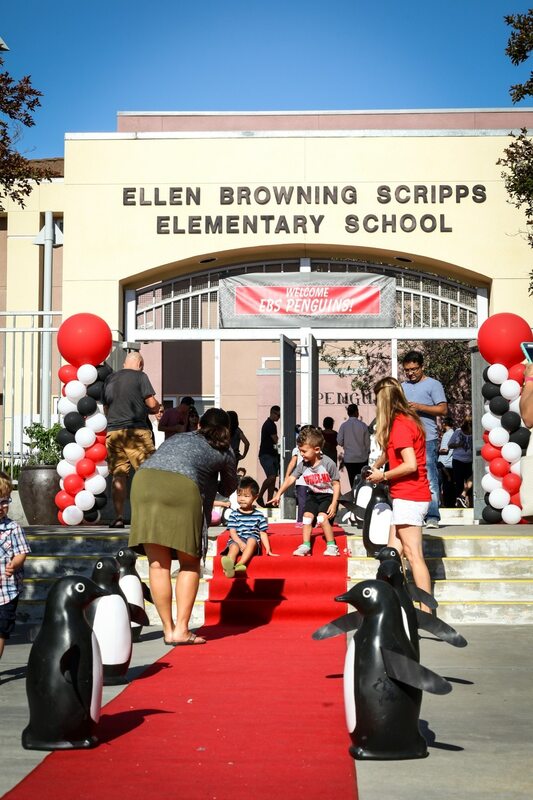 Thank you again for all your support to make EBS the truly amazing school that it is. Sneak Peak! The new magnets were given to teachers this week so you can get a look. The all new 2017-18 magnet is a new shape this year….a RECTANGLE! This is also a fun way to identify other EBS families when you are at the park, the soccer field or maybe even somewhere on the freeway! If you are receiving a magnet they will be passed out soon by our AFP Board as they go through envelopes and distribute magnets. Many parents have asked what we do in the afternoons after the 206 students are dismissed. Each day, we have different responsibilities the entire day. We teach in the morning until 12:30 and in the afternoons, we take our lunch and then have other jobs on the campus until 3:15. Most of our other jobs involve language testing, language support groups, intervention groups, etc. Then we prepare for our next day/week by planning and prepping after the official school day is over. Each week we will be celebrating a new color! 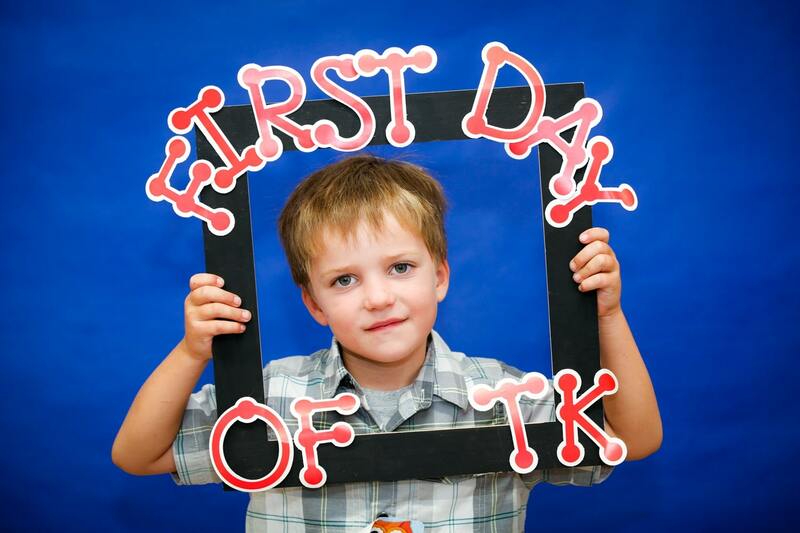 We will be doing this along with all the other kindergarten classes. 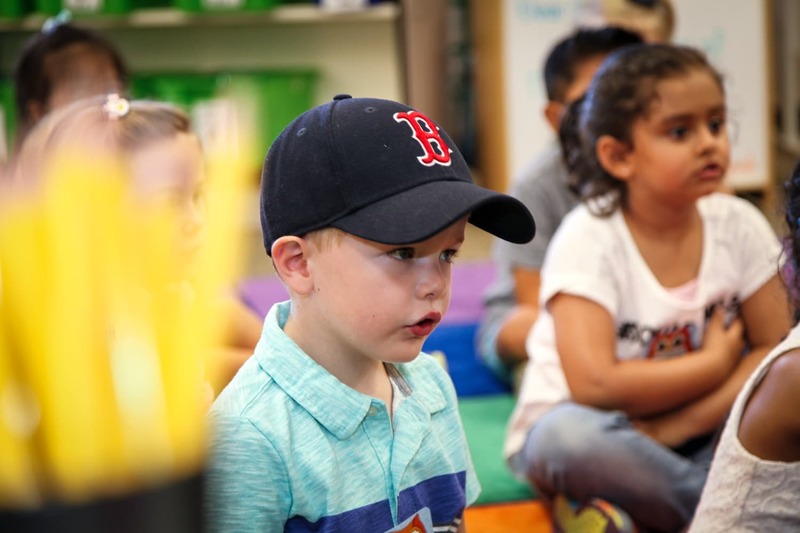 We will talk about how to spell the color, we’ll find the color, often do a book or poem about the color and on Thursdays we will wear the color! 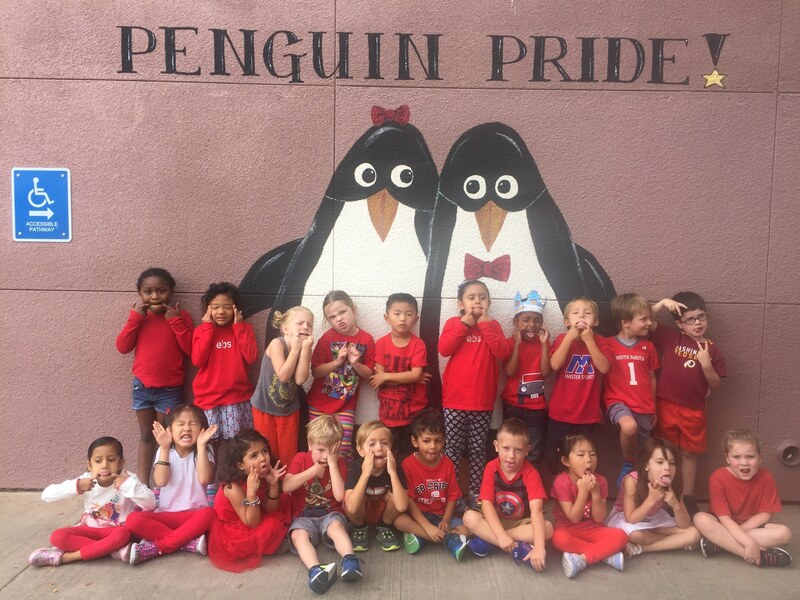 This week we celebrated RED. 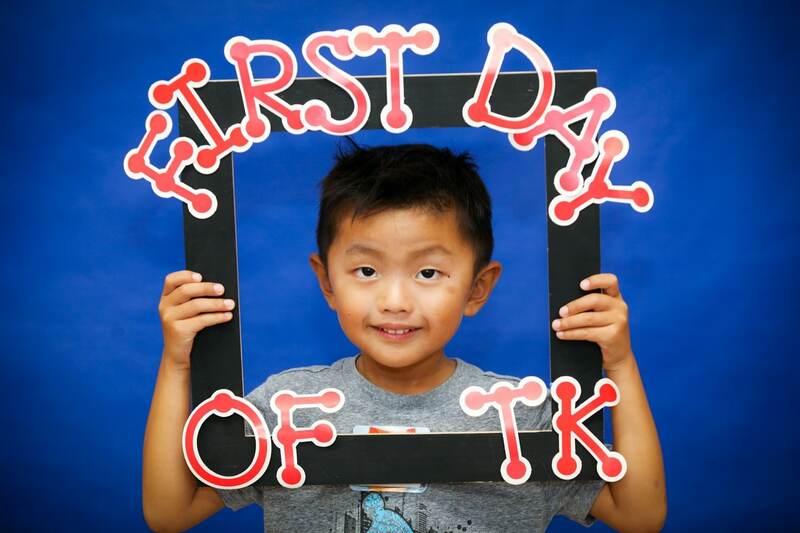 Our RED picture was on the FB page, and our silly RED picture is below! Our color next week is BLUE! 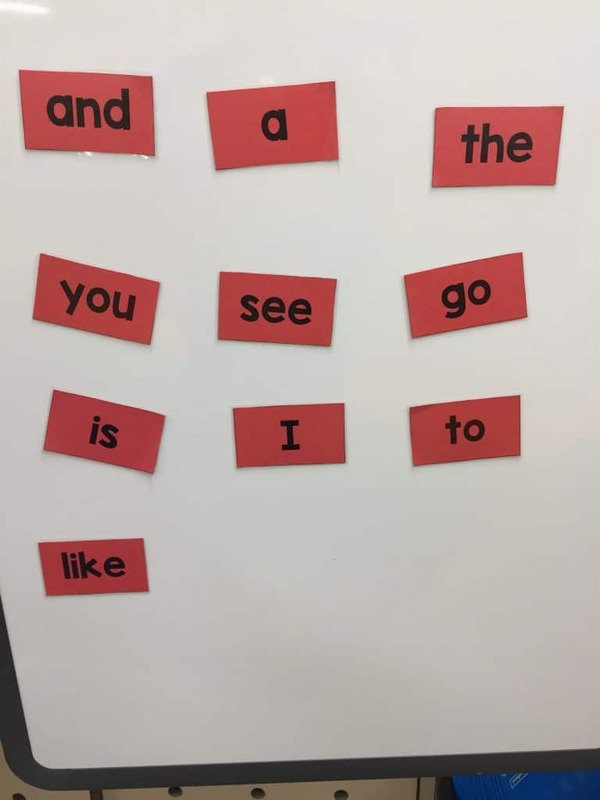 Each week we will be studying a different letter and its sound(s). We do not go in alphabetical order, but in a designed order that is more in line with the sounds that are more familiar and easier to make. 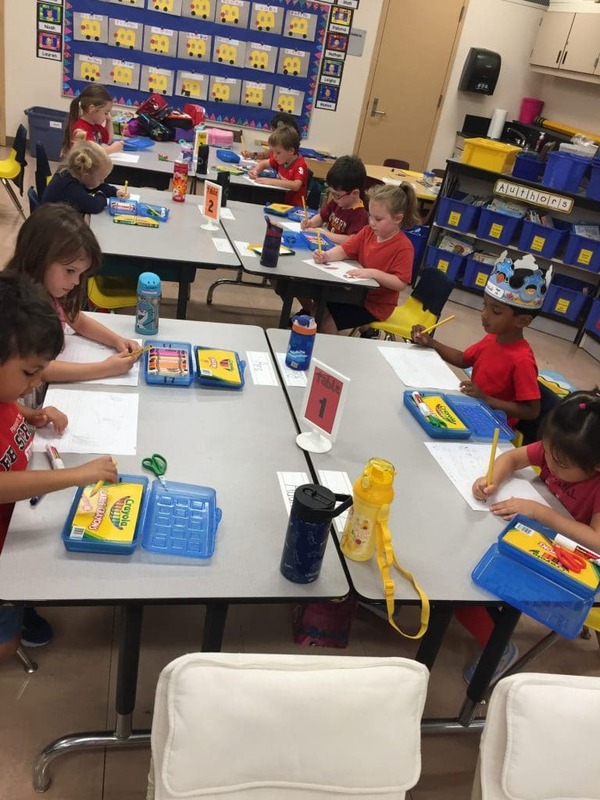 We practice saying the sound, hunting for things that make that sound, draw pictures of items that start with that sound in addition to writing the letter and reading a small book that is all about that letter. These books practice sight words, the sound/letter of the week, and writing the letter in both upper/lower case. These books will eventually go home, but are also used in class for reading. You got a September Sight Words paper, Game Directions and a red copy of the 10 sight words for September. We will be focusing on these words in class. We sent these home as a option to practice/play with these words at home. 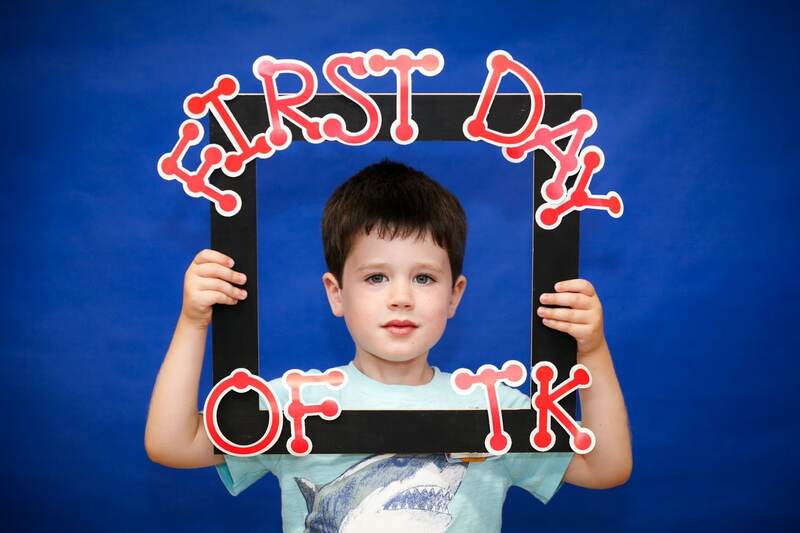 Sight words are a foundational skill of reading. 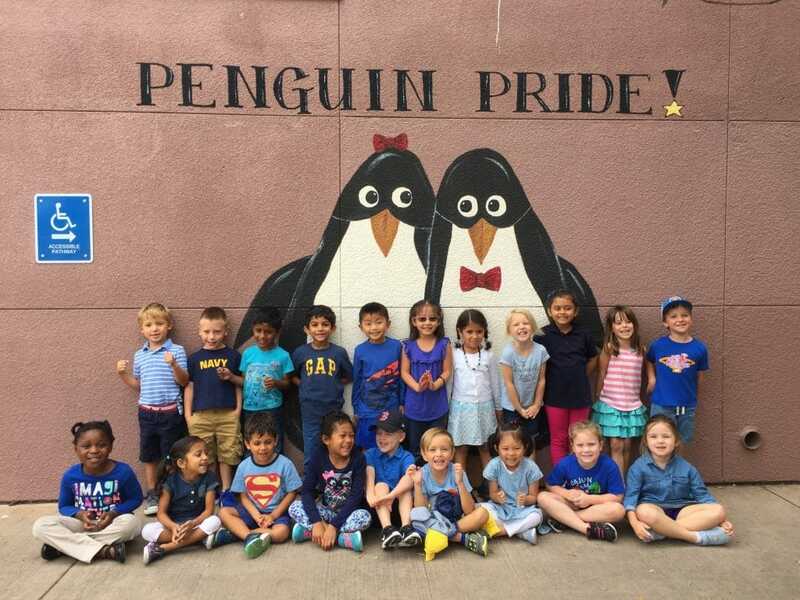 BLUE DAY – Don’t forget to wear blue! Thank you for your patience as we worked out the glitches of this group! 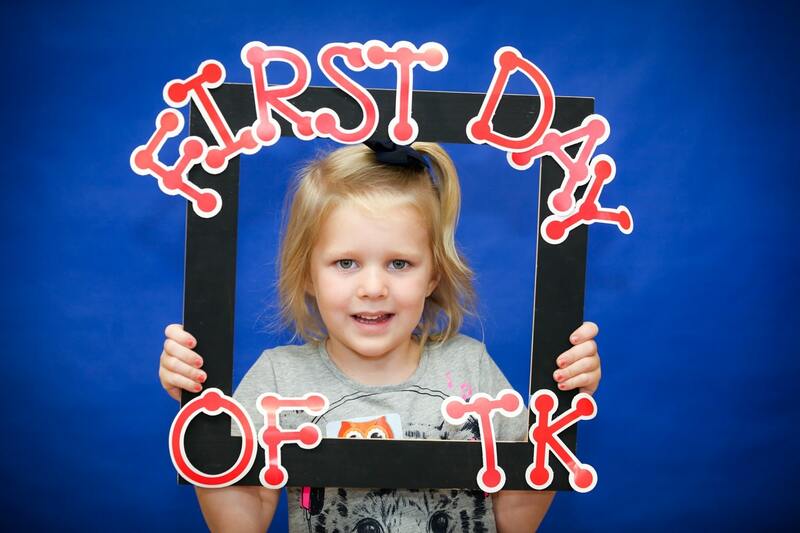 We have been posting some bonus pics and highlights of our week along with reminders. Many of these posts are unique to our private group and are and easy accessible way to enjoy class news! 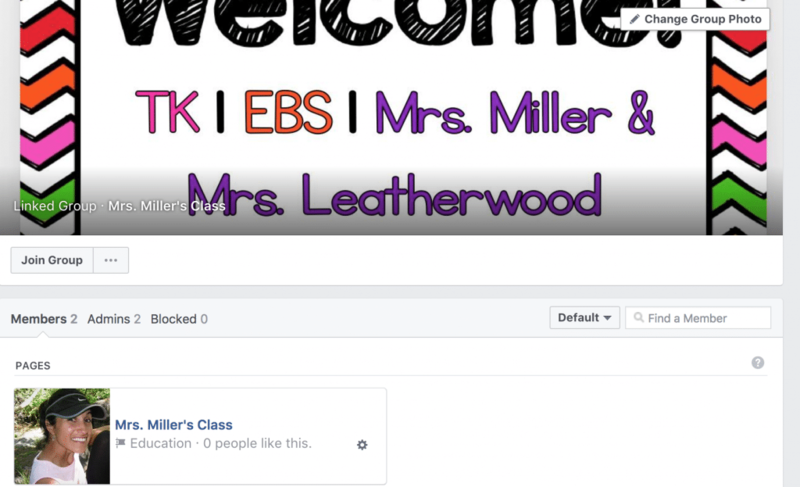 If you are still not in the group and want to be a part, send Mrs. Miller and email with the Facebook email that needs to be added! This past week we continued working on sorting and classifying. We discussed some different shapes and the attributes about each shape. 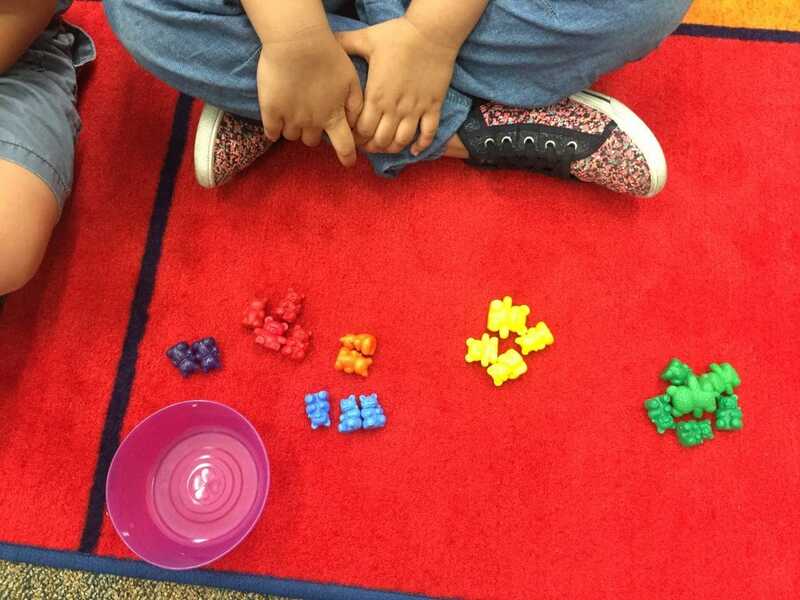 We shared again that there are different ways to sort/group items. We practiced sorting by shape, color and size. This week we will continue to practice how to sort by different attributes using different sorting objects. WRITING CRAFT: In Writing we have been learning about what writer’s do. Over the past 2 weeks we discovered we are writers! Last we shared how writers, decide on a topic, show the pictures to describe their topic and add words . This week, we focused on when we think we’re done, we’ve just begun. 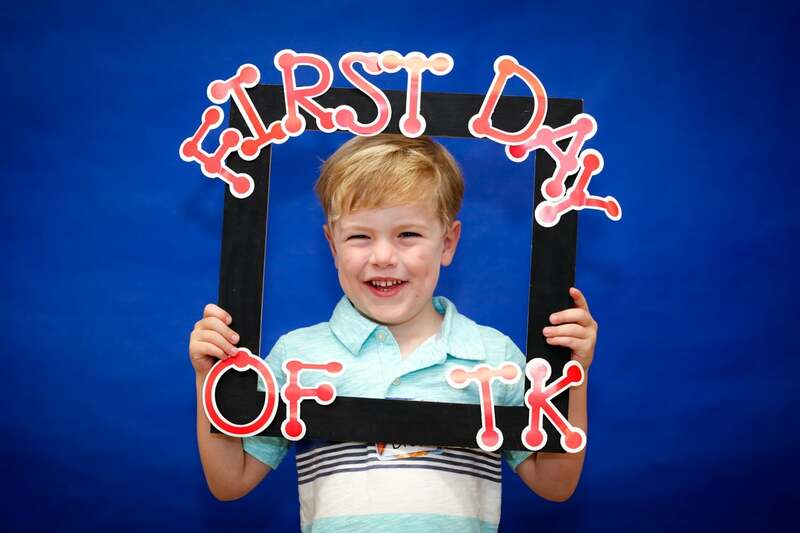 At that point we are ready to begin adding more….words, pictures, colors and even labels. Adding labels by our pictures helps our readers to understand more about our writing! INTERACTIVE WRITING: This part of the day is where we practice how to write. 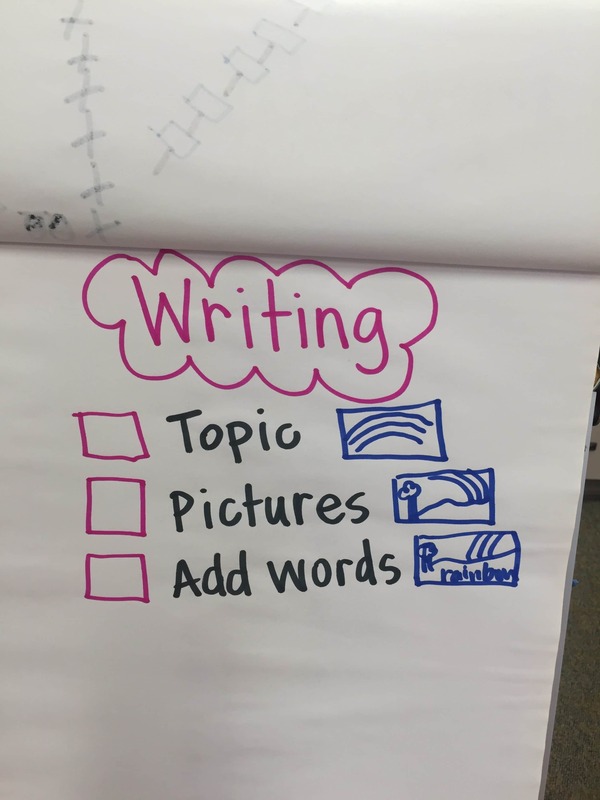 This is a shared group experience where everyone is writing. We started writing in the air and on the carpet with our fingers and eventually we wrote on paper using clipboards and paper. We practiced how to write some lower case letters in some of our friend’s names. We will continue practicing writing letters and stretching sounds together to write a group message. This is a part of our day where we read together. It is usually a text on the doc camera or in a big book so we can all see the same text as we read together. As always we discuss the meaning of the text first and then continue to practice different aspects of reading. 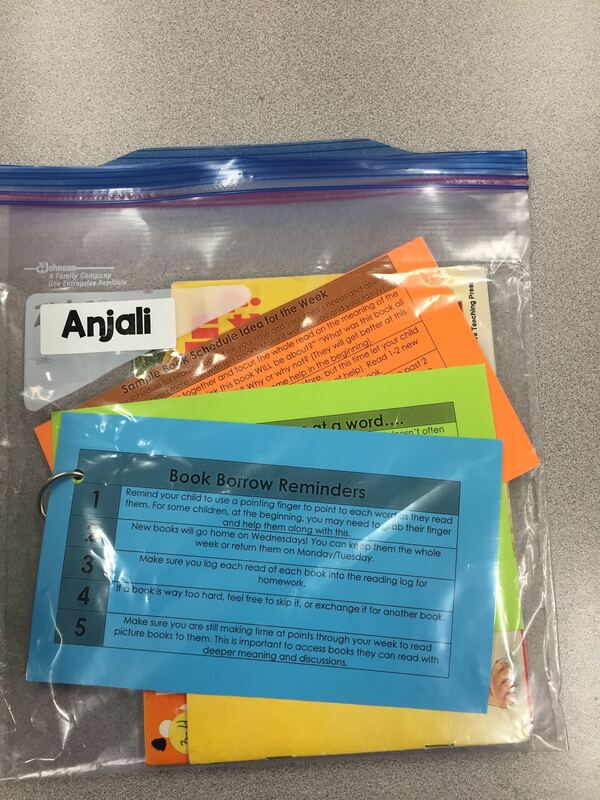 This allows us to read the text multiple times (a great reading skill) for different purposes each time. These are 2 of our current favorite books! You may have heard of one of these from your little sweeties! 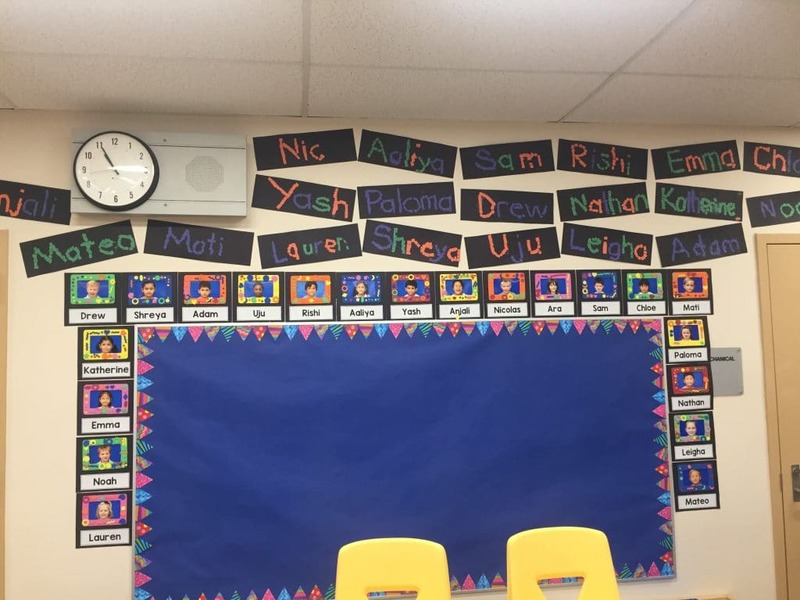 We have continued to practice working on learning our own name and the names of our friends. 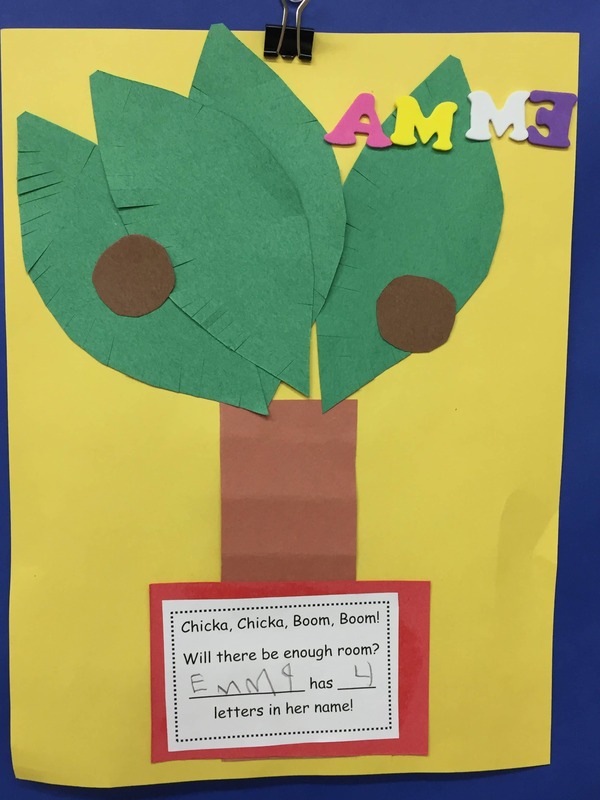 This week Mrs. Leatherwood, created some name art using the book Chicka Chicka Boom Boom. The students worked on finding the letters of their name and counting how many letters in their name. 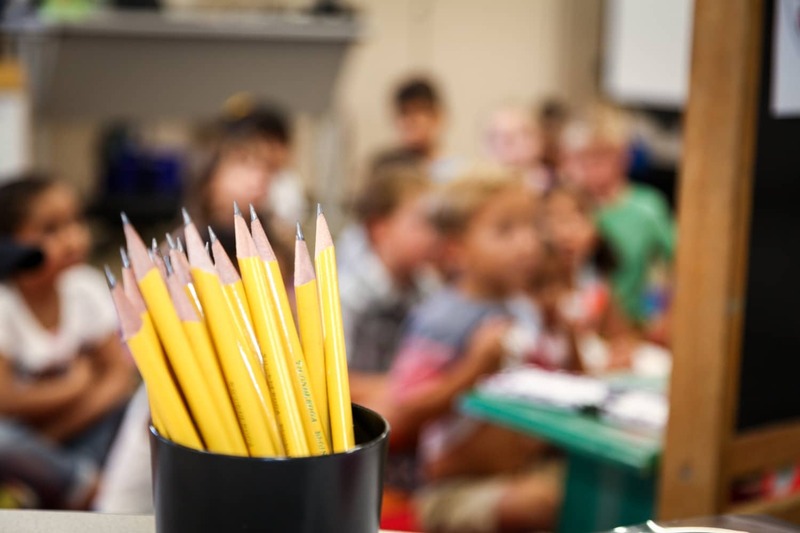 You may have noticed a stapled packet in your child’s folder this past Friday. 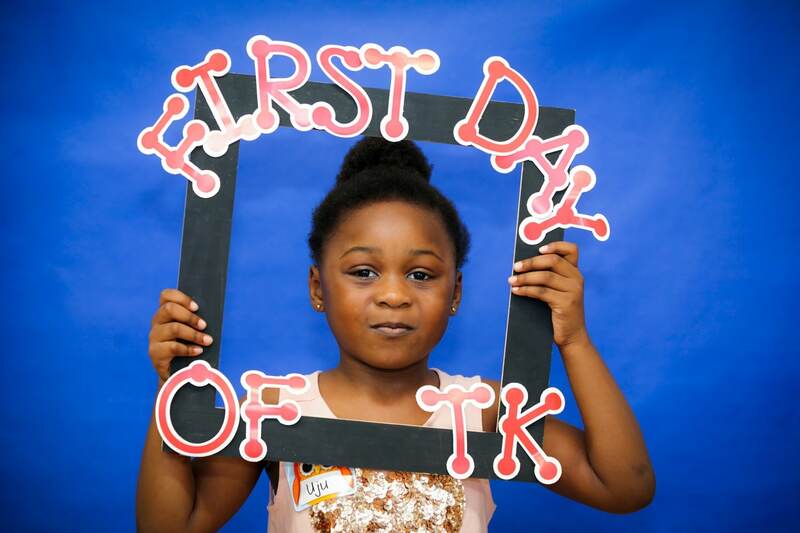 Our annual Super Pledge has begun! This is an exciting time where families all have the opportunity and option to donate to cause of making our school the magical place it is. With many of the budget cuts we receive less funds each year. 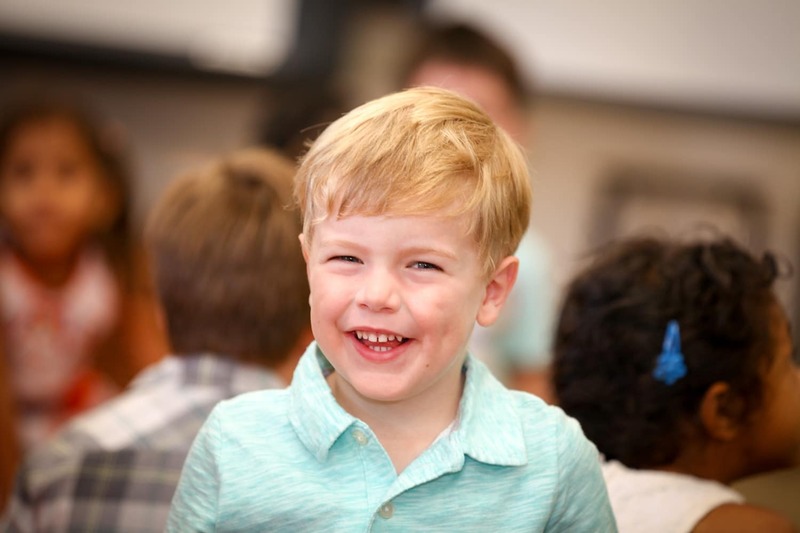 The AFP/families at EBS are what created all the extra support and educational experiences that are offered at our school. This is completely optional and doesn’t required you to sell any candy or fundraiser items to your friends and family. 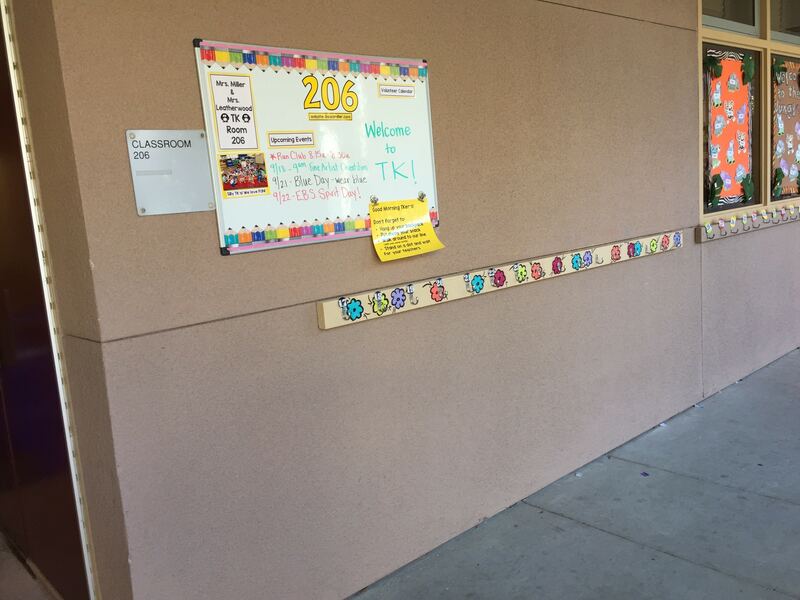 Our Super Pledge is also what provided all the classroom materials to stock each classroom to start and finish the year! We are so grateful to our AFP! Please read through the packet carefully and let me know if you have any questions. 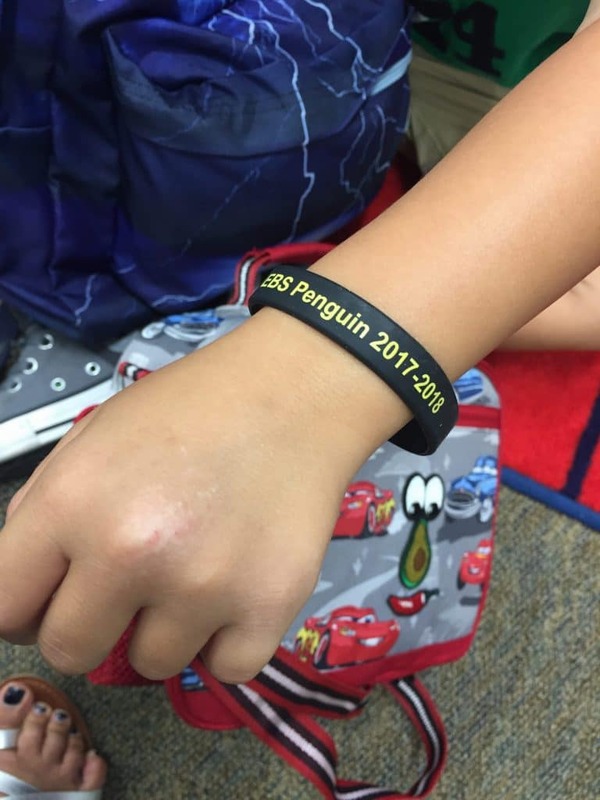 Each child will receive a bracelet when they return their envelope regardless of whether they donated or the amount they donated. 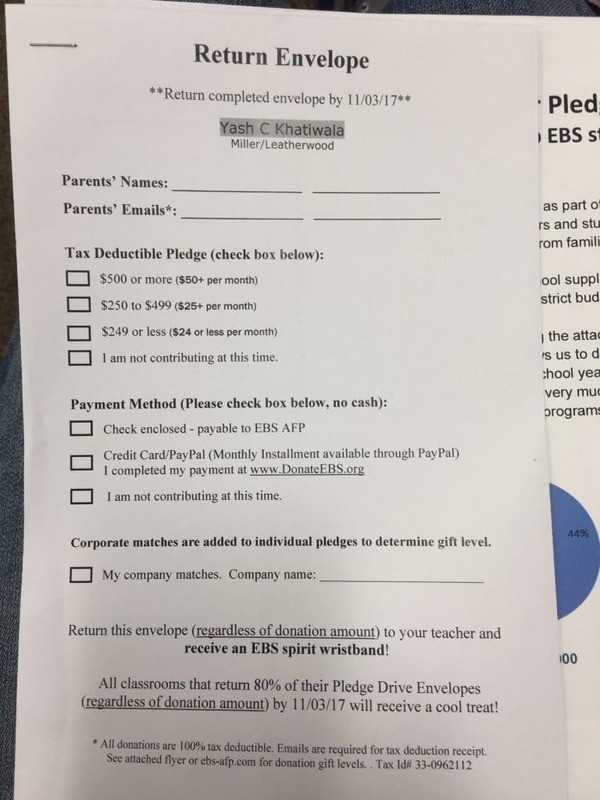 Simply fill out the envelope and return in your child’s folder. 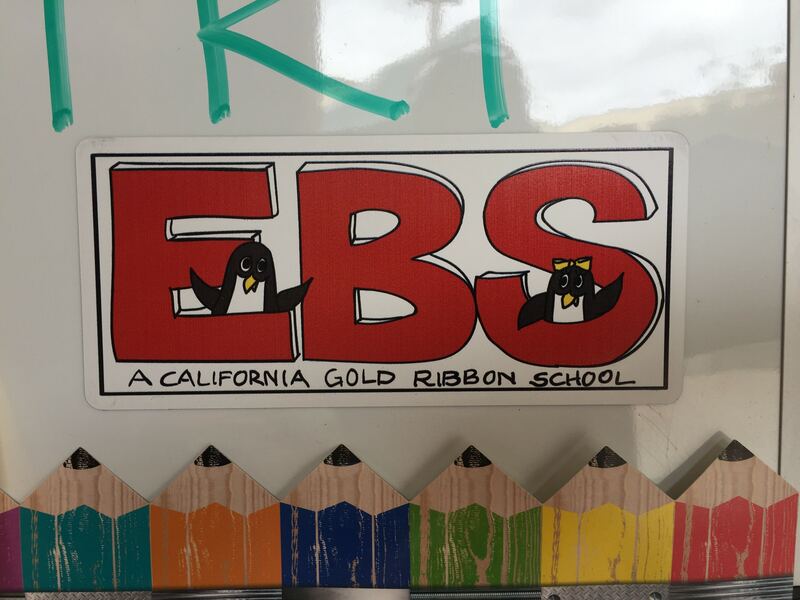 You may have noticed all the EBS magnets driving around town…this is also your opportunity to get your own EBS magnet as a proud supporter of our school. 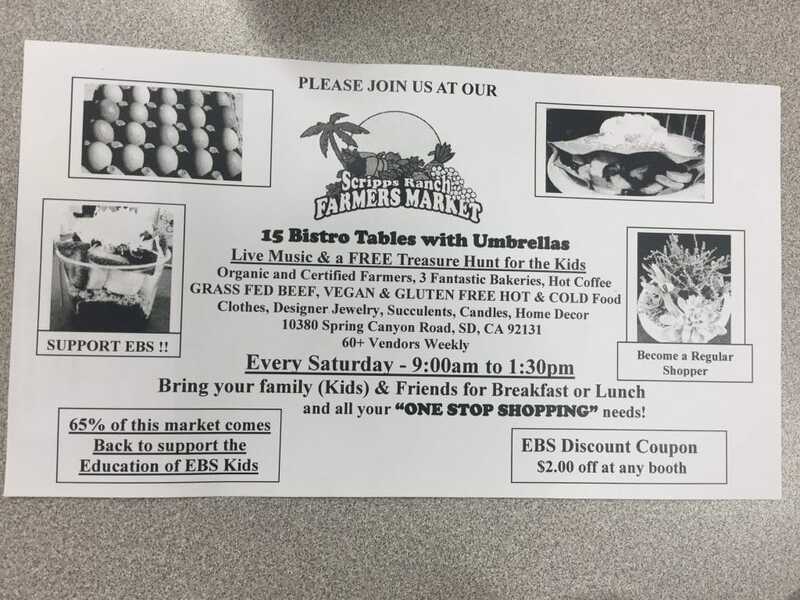 Did you know the Saturday Scripps Ranch Farmer’s Market is a supporter of EBS! Everytime you shop there, you are helping our school. You received a flyer this week in your child’s folder along with a free stamp card. 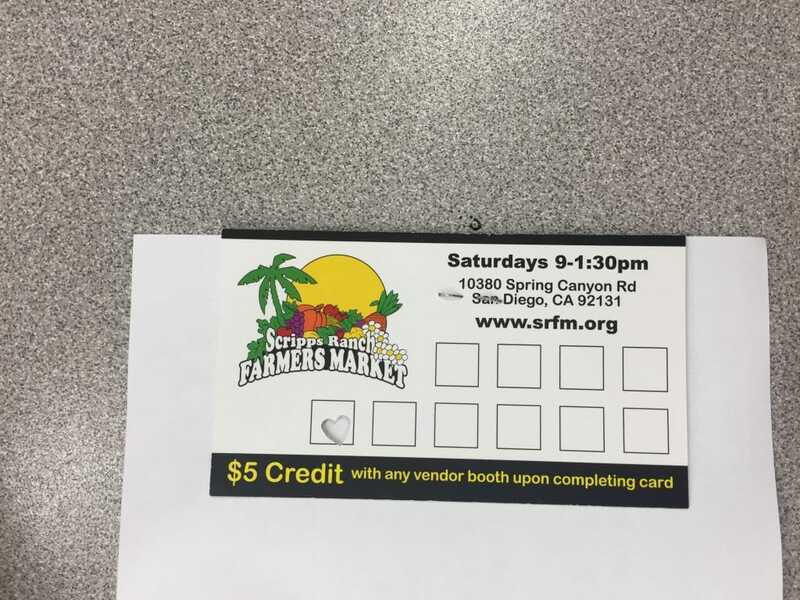 Feel free to check it out if you’ve never been and enjoy our awesome Farmer’s Market while helping our school! 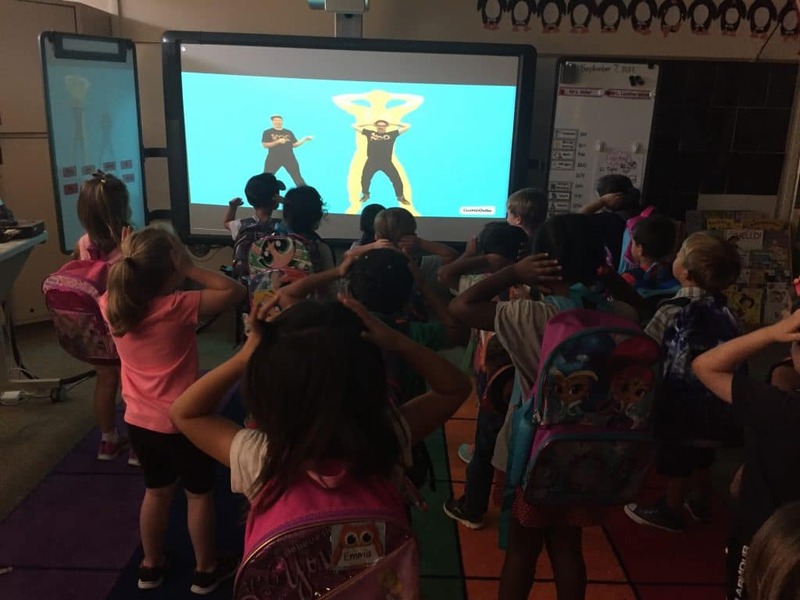 Have you heard your kids telling you about Go Noodle yet! They LOVE this 5 min end of our day! With the exception of Fridays, we finish our day with a few Go Noodle songs. These are silly 2-3 minute videos that have the kids sing and dance along. Its super fun, cute and they LOVE it! Here’s a shot of your little dancers doing their dance! 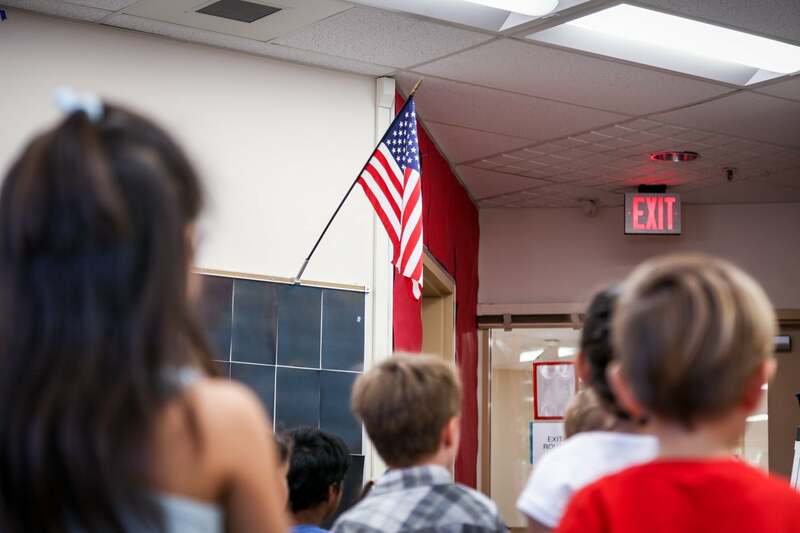 You may have heard that your child has a special number in class. 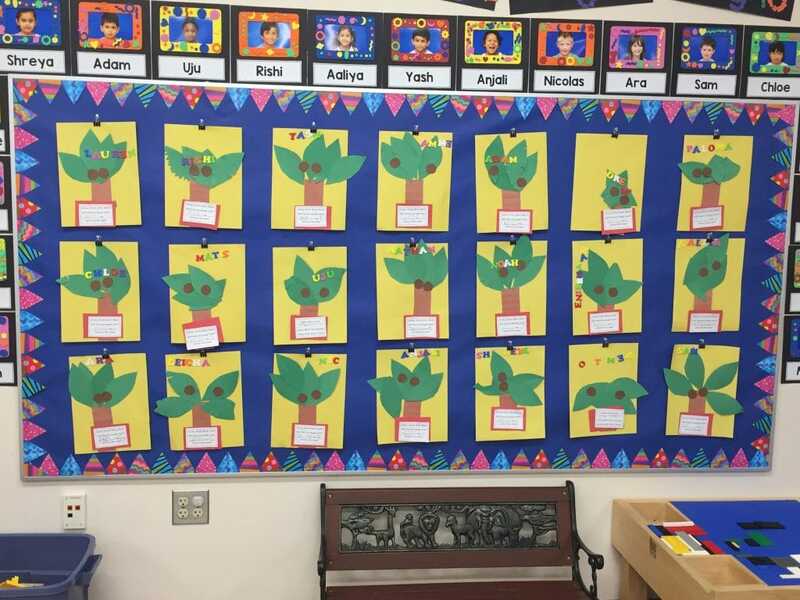 You can ask your child what their number is. 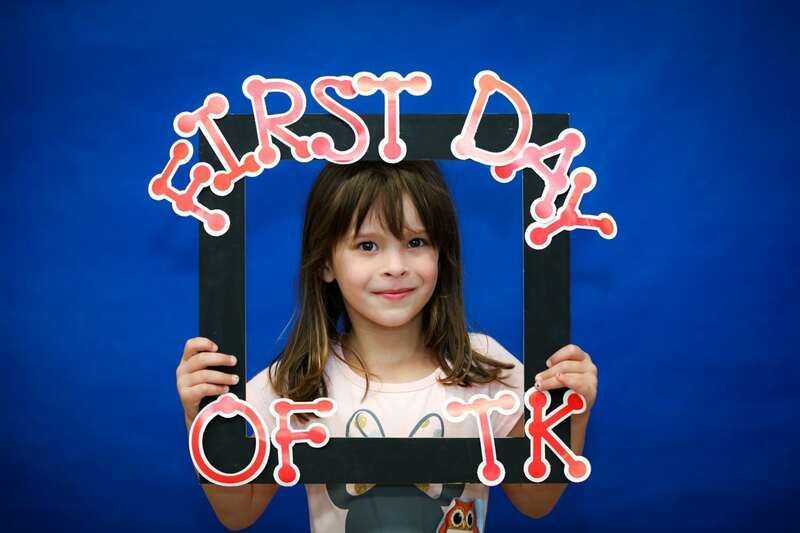 Almost everyone has theirs memorized and is slowing learning what it looks like and how to write their number. 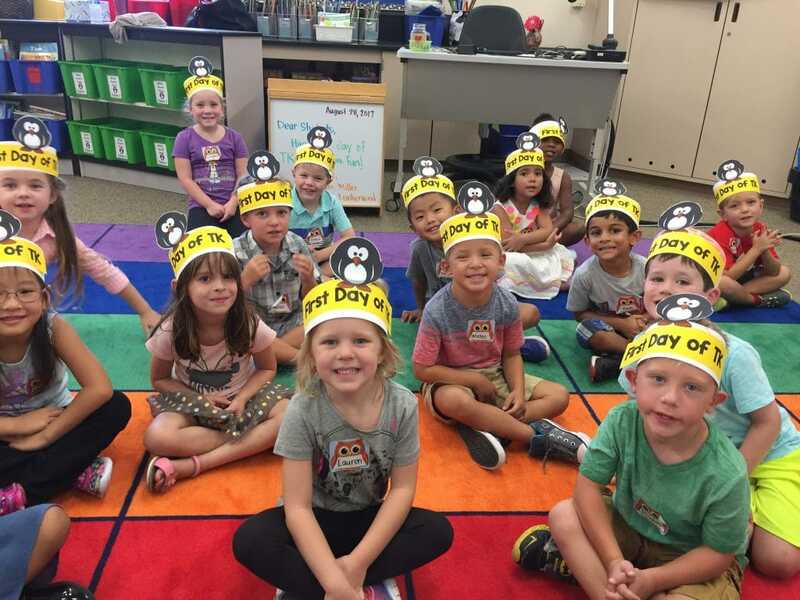 We use this number for many things but one daily habit is to “line up on your number.” When we are in the class, we line up on our numbers and in the morning we line up on our numbers as well. 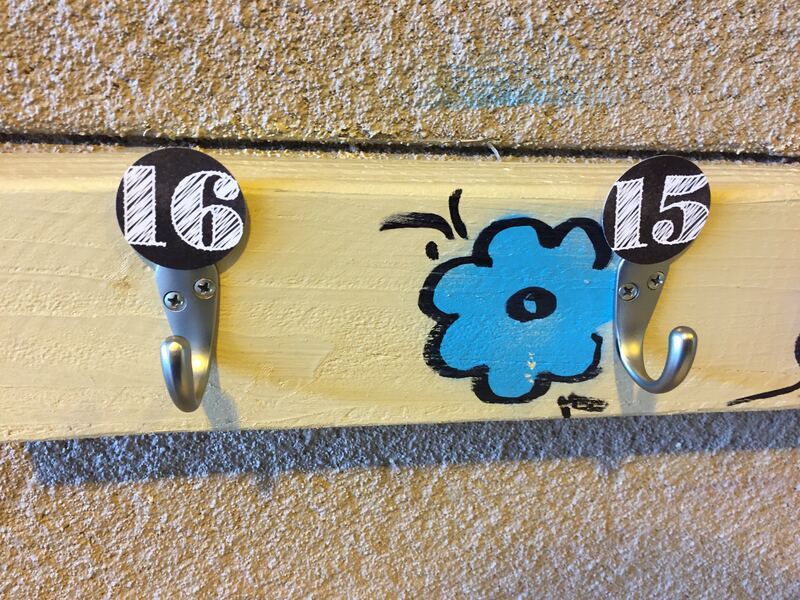 You may have noticed the chalked numbers at our line. 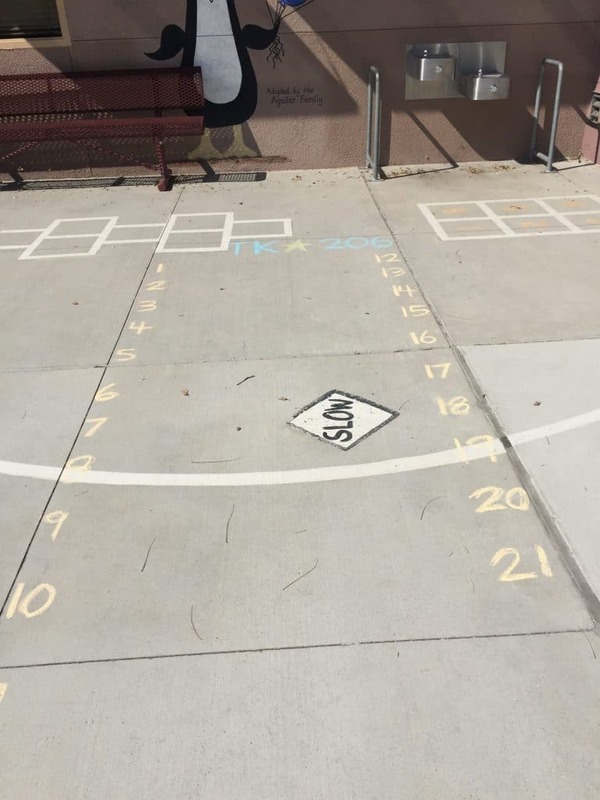 We try to keep up on the chalked numbers as they fade with sun and rain, but this is a helpful way for the students to know their place in line, not race to be first and to space themselves out. 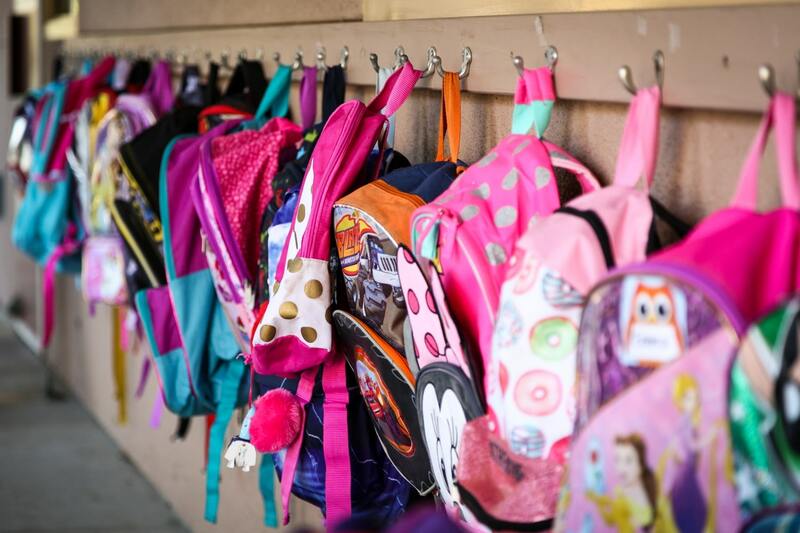 Soon we will add numbers at the backpack hooks as well to help again with their routines. Thank you for your support. This week, we had a new safety drill. The week prior we had our first fire drill where the safe place was outside. Loud bells rang to warn everyone to get out of the buildings. 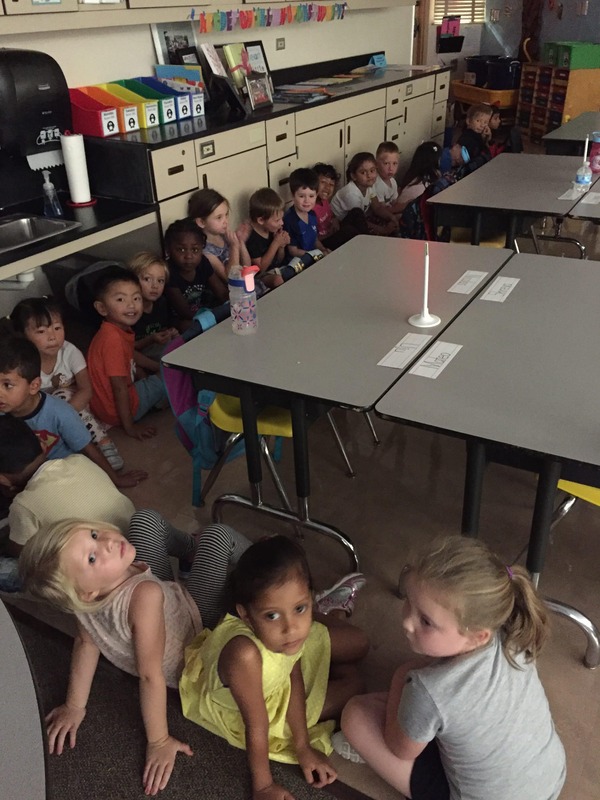 This past week we had a Lock Down drill, where we locked ourselves in the room as to practice if the danger was outside the classroom. In this case, we turn off all the lights, lock the hallway and classroom doors, close the blinds, and stay quiet away from windows. The students did amazing and understood how it was important to stay safe, but weren’t scared. I’m so proud of them and their maturity to do this drill so magnificently! You may have seen the email I sent yesterday. I am sending it again via blog post so you can all be updated on the Facebook issue. As like last time, it is PRIVATE (no on other than members can see who is in it and what is being posted). With that being said, we will have to go through the approval process again. Thank you in advance for understanding. Welcome to this week’s updates! 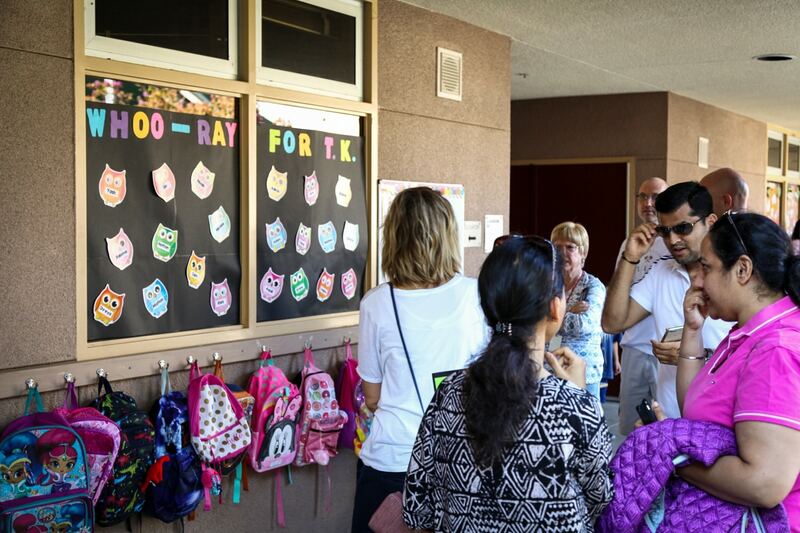 Each weekend I’ll be putting out a newsletter/update to tell 206 families about our week. Typically the e-blast will come out on Sundays so you can read it on your weekend. If it is a holiday/vacation, the blast make come out later. Please take time to read or skim these posts as some information is very significant to events, holidays, date/times, etc. 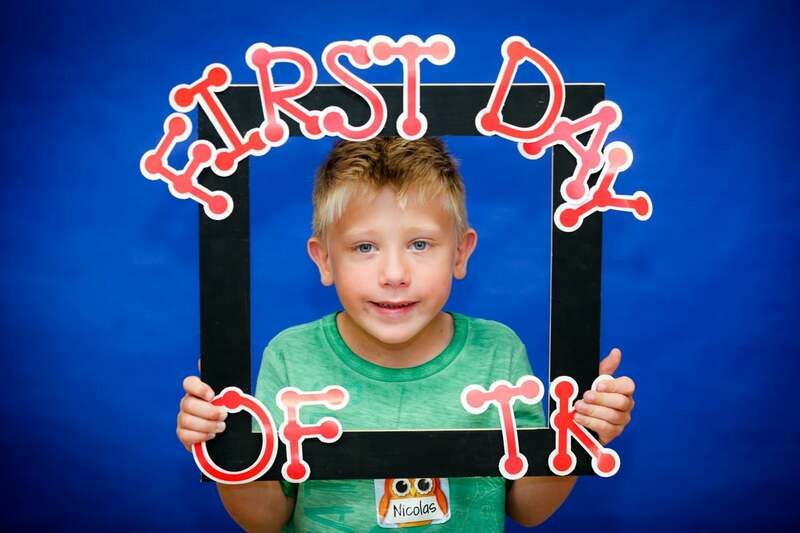 My sweet and talented husband came in the first day to capture your sweet children on film! 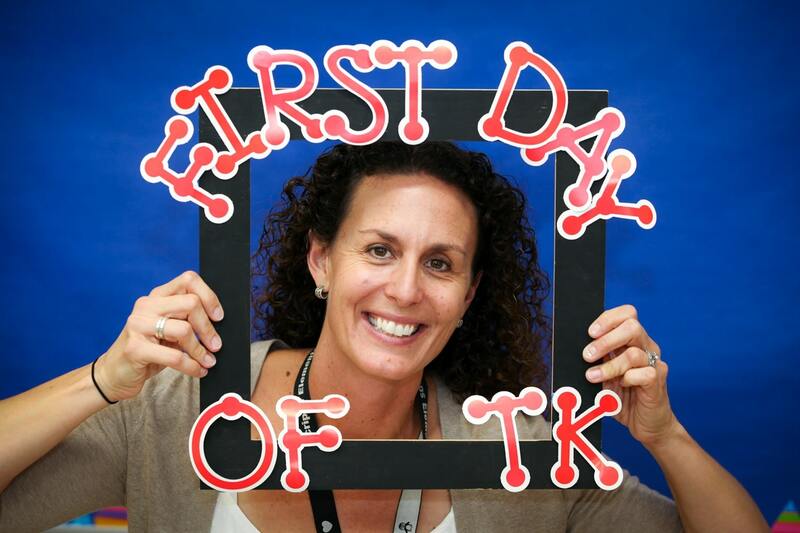 Here’s your official 1st Day Photos! 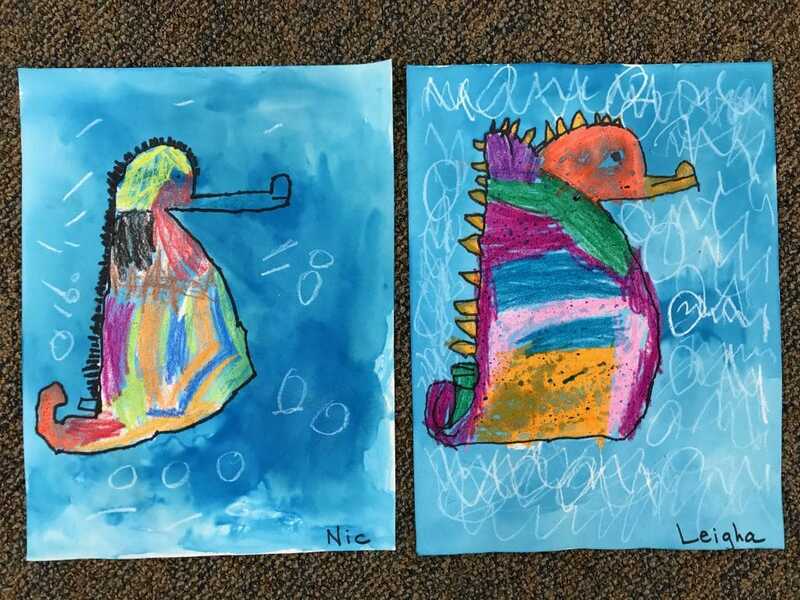 This week, we did many pieces of art this week! 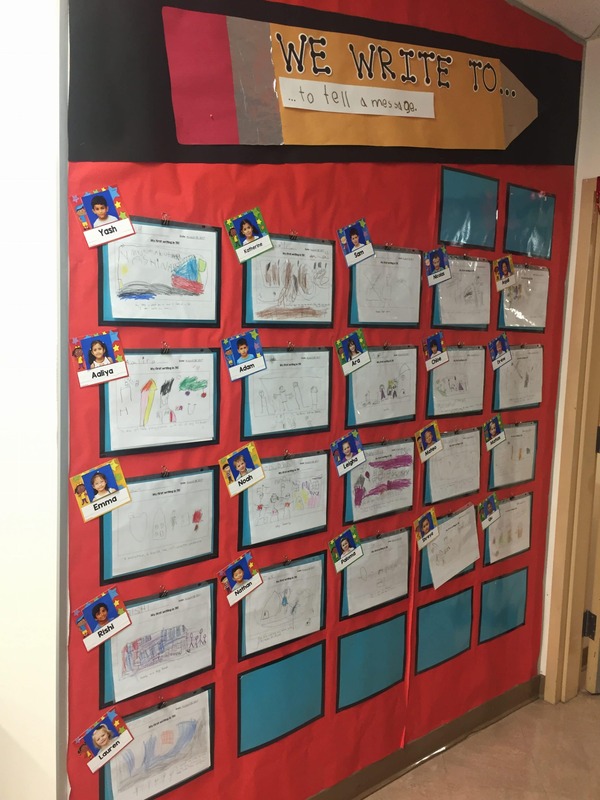 Some of the art was to celebrate this first week. Other pieces were 2-fold in that they practiced a skill, such as cutting, or following directions in addition to creating a piece of personalized art! 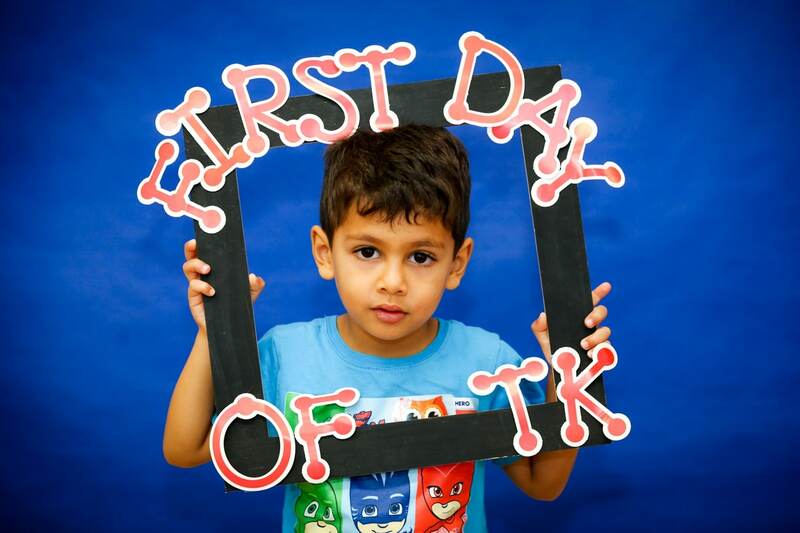 This week, we made 1st Day of TK Headbands, we decorated foam frames which were then used to house our photographs. We made our own EBS Penguin, and followed specific directions to draw a self-portrait. Finally on Friday, we made mosaic art, by building our name with small, colorful pieces of paper. 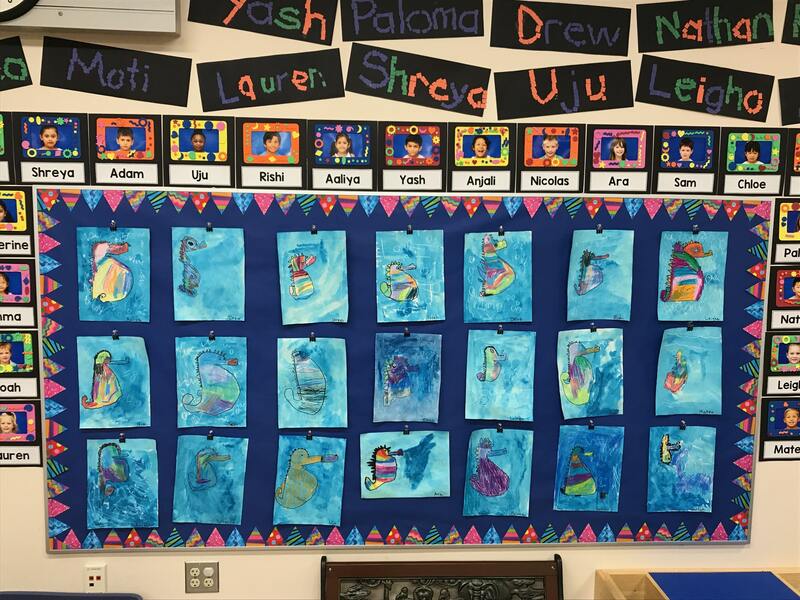 The students tried their best and enjoyed making some colorful and stunning art! This week in Math, we focused on sorting and classifying. We discussed what sorting is and practiced grouping different math manipulatives by color and by shape. We will continue discussing classifying next week and practicing with different manipulatives. Over a couple of days we collected a few pieces of writing and needed a way to store our writing. 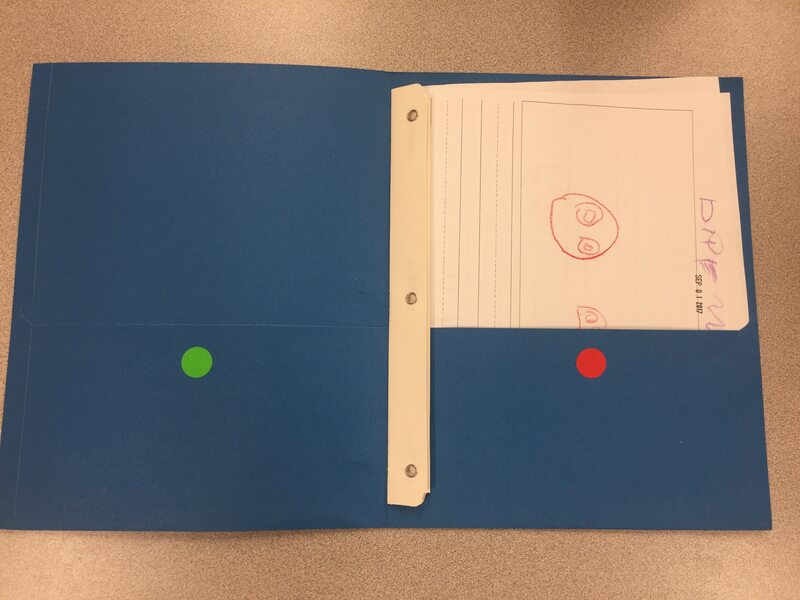 On Friday, we each got our own folder to keep our writing that was finished (red dot side) as well as our writing that we aren’t finished working on (green dot side). It was such an exciting week of writing! We can’t wait for next week! 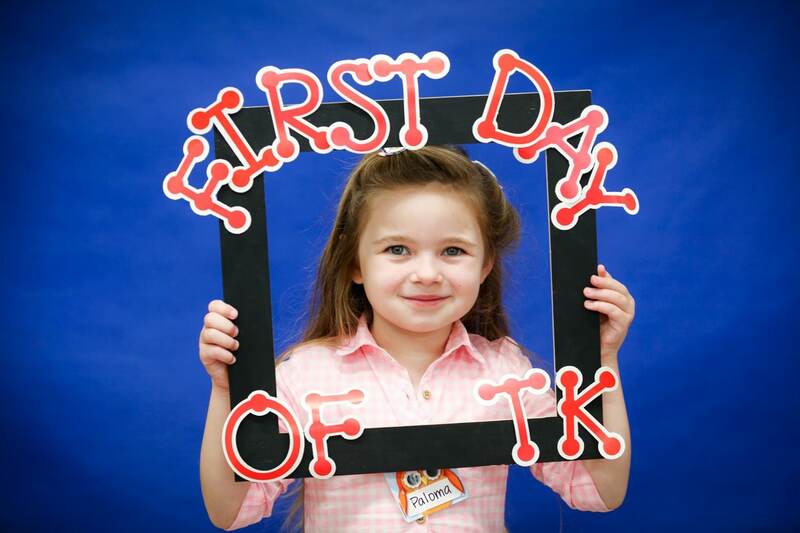 On Friday, each child received some information regarding the cafeteria. One paper gave your Child’s PIN number and a practice keypad they can use. The purple paper listed some important information about purchasing meals. If you plan to purchase meals from the cafeteria, please make sure to tell or email us for the first time so we are aware and able to help them through the process. Thank you in advance! 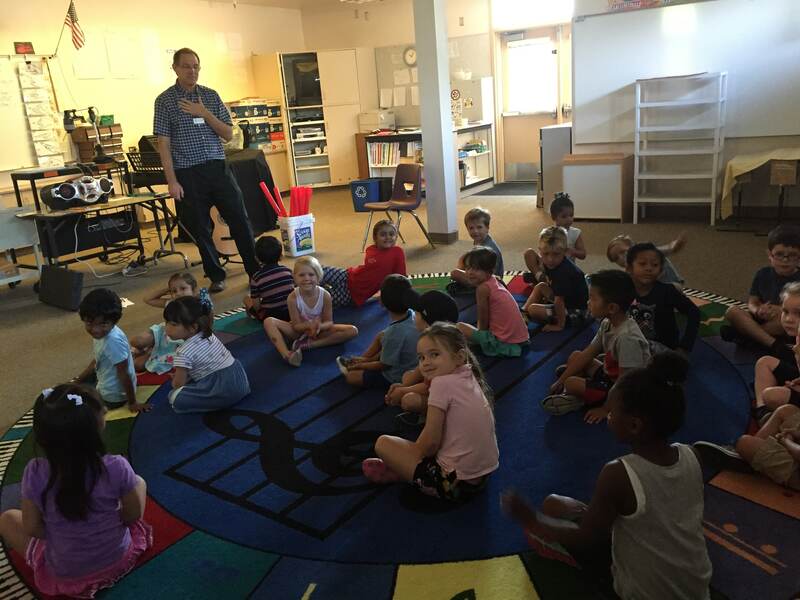 On Thursday we had our first music class. 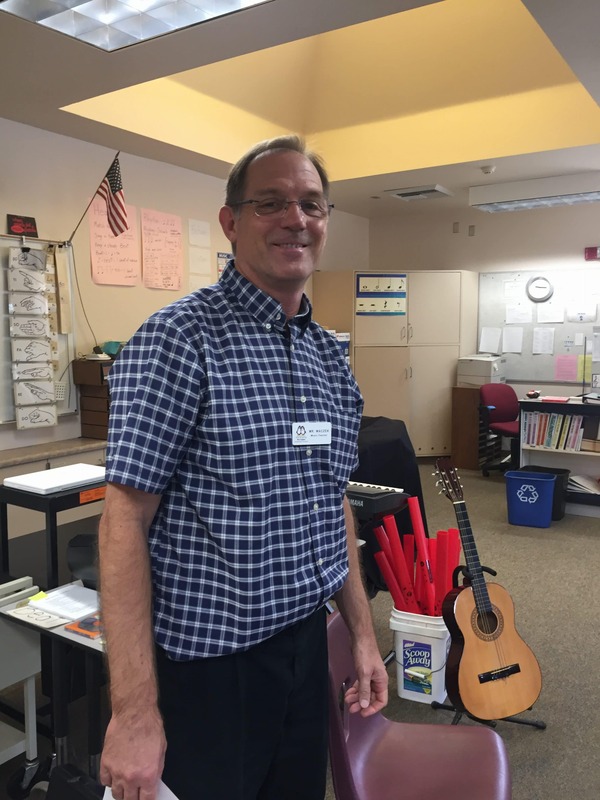 The students met our wonderful music teacher, Mr. Waczek (/vawt/ /seck/). 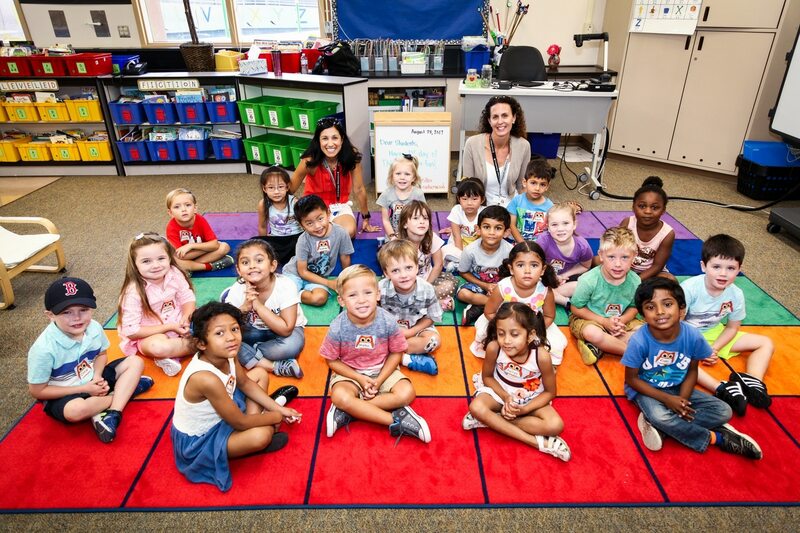 The students loved their first class and go to music every Thursday! If you haven’t joined our FB page, please join! We have up to 20 members as of now. I have been posting special pics that don’t come out anywhere else! You don’t want to miss out. If you need to get added, please email me and we can add you to the Private Group. In addition, please add in your own posts and photos! 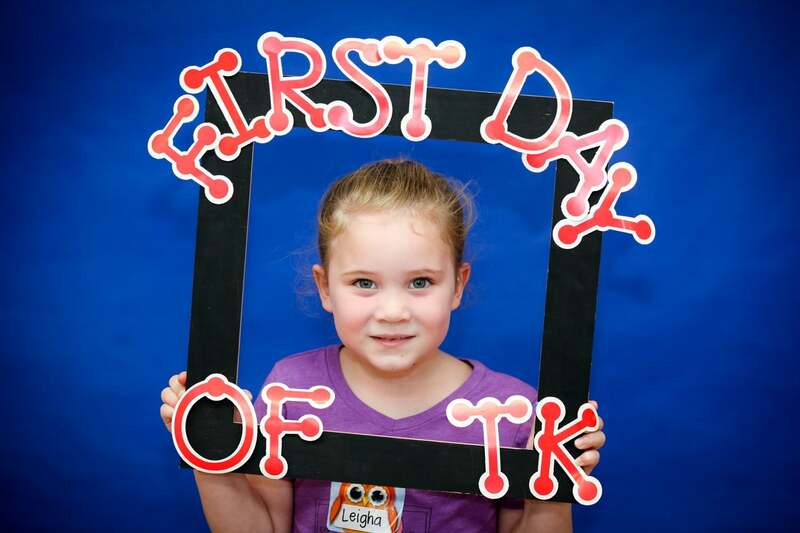 Its a place we can all share about these sweet kiddos! Assessments? What are they for? If you’ve been wondering about the assessments that we had last week after school, no worries. 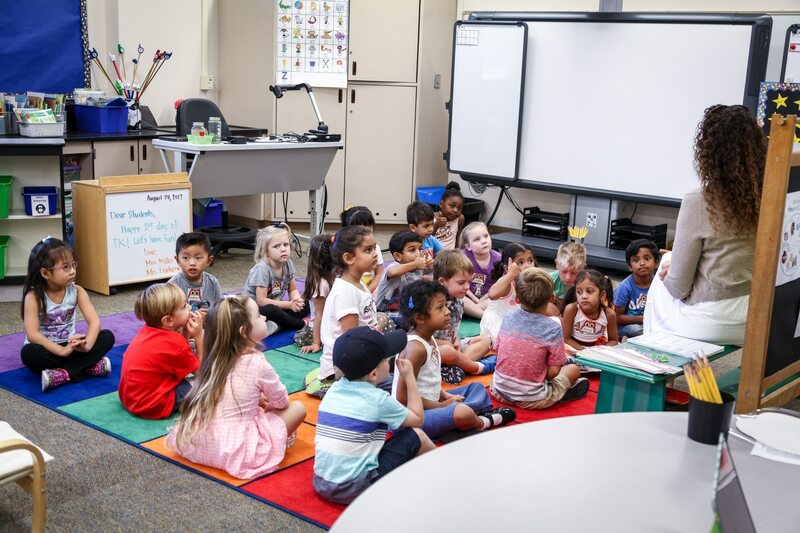 Since all the students are coming from different backgrounds with different personalities, it allows us a little one-on-one time to get to your know child a little better, along with knowing what their next steps are. 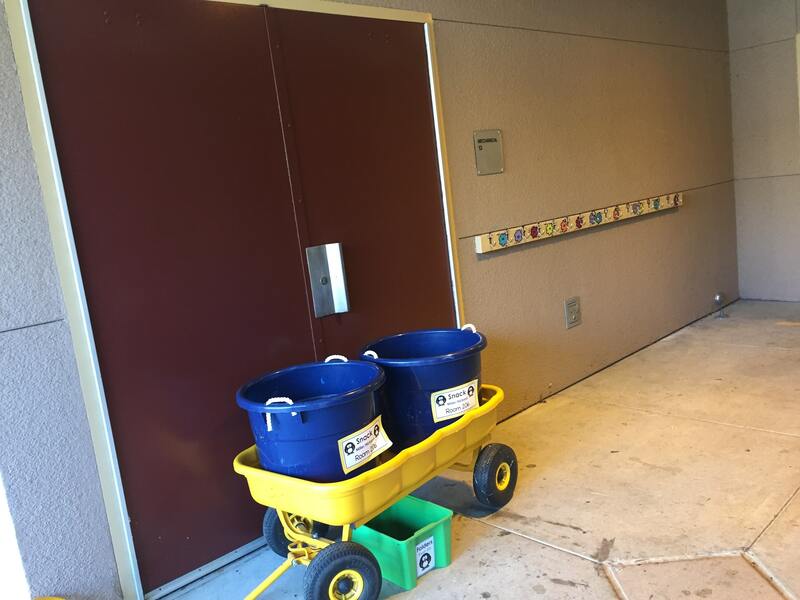 Please make sure you have your child use the restroom before school. Don’t forget to label your child’s name on everything.